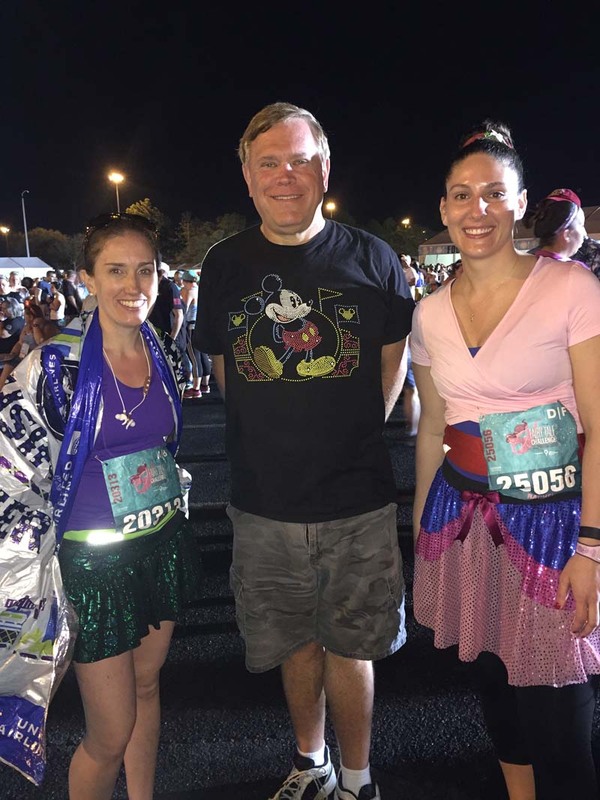 This short trip was to see our niece Marissa run her third Disney Princess Half-Marathon and to enjoy Disney with a little prince, Liam and princess, Madeline. 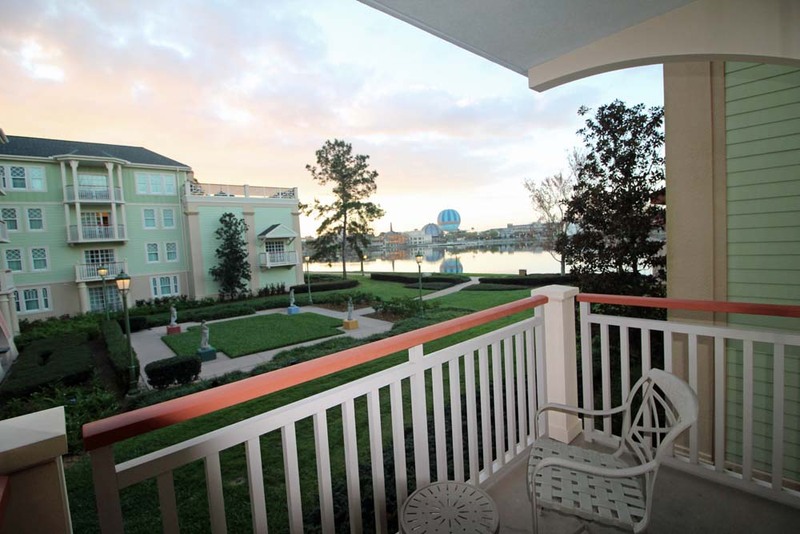 Using our Disney Vacation Club points, we reserved a two bedroom preferred dedicated villa at Disney Saratoga Springs at the eleven month mark. At the seven-month mark, I tried to book at the Beach Club or Boardwalk, but nothing was available. I put two wait lists in but they never came through. 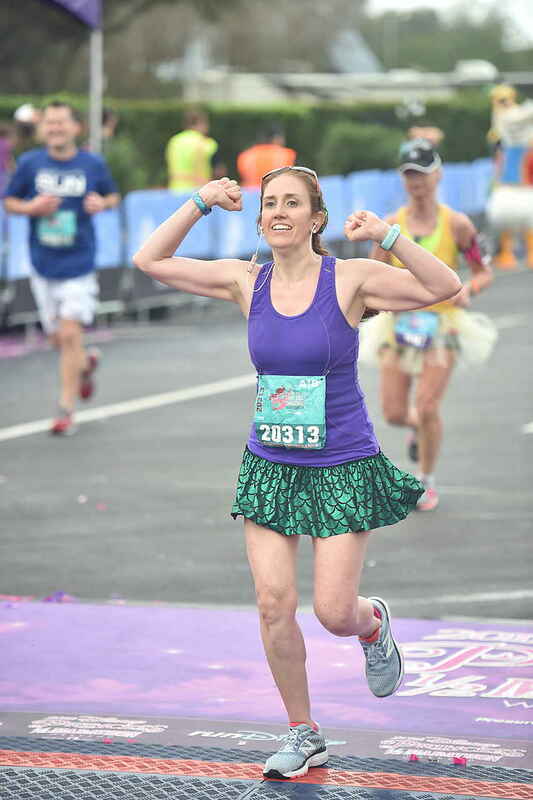 If they did, we would have got to see Marissa run the 10K as well. We asked for the Springs section, but ended up at our favorite Congress Park area at the resort. We were up early at 2:45 AM to get ready and drive over to my nephew Tim’s house. We left our car there as my brother-in-law Rich drove Tim, Marissa, their two little ones along with Kelli and me to Westchester County Airport. This small airport is a fourth option in the NY area to fly out of besides LaGuardia, JFK and Newark. It is also the closest and we were there in 16 minutes! Since we were early, we had to wait for the baggage check line to open a little after 5 AM. Security wasn’t too long and there are only 4 gates so we had a bit of a wait to board our 6:30 flight on JetBlue. Our plane’s name was Blue Traveler. Grandma Joan had made a deal with Maddie. 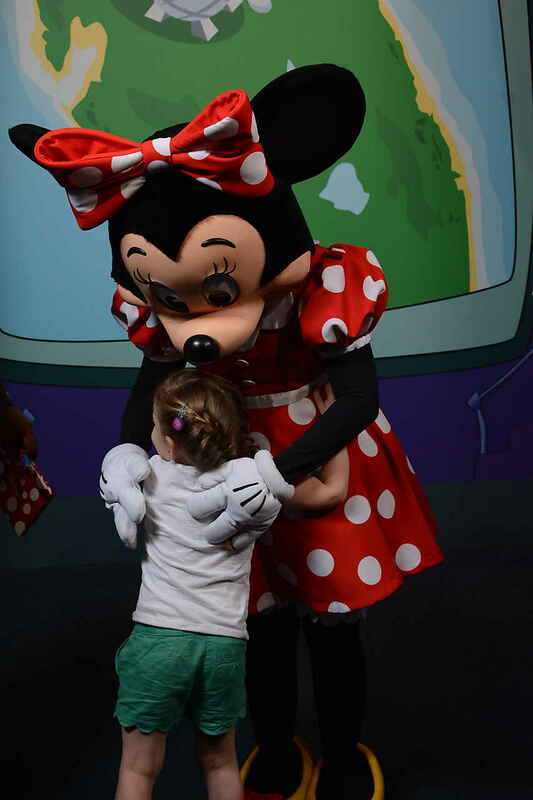 If she hugged Mickey, she would get a toy. Kelli also made a deal. 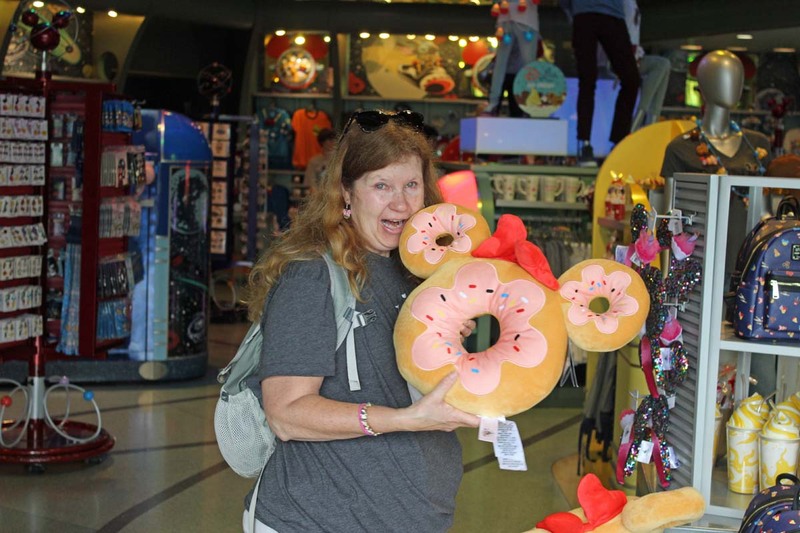 If Kelli did not have to go on the Mine Train with Maddie, she would also buy Maddie a toy. Maddie turned that around and made a deal with Kelli. 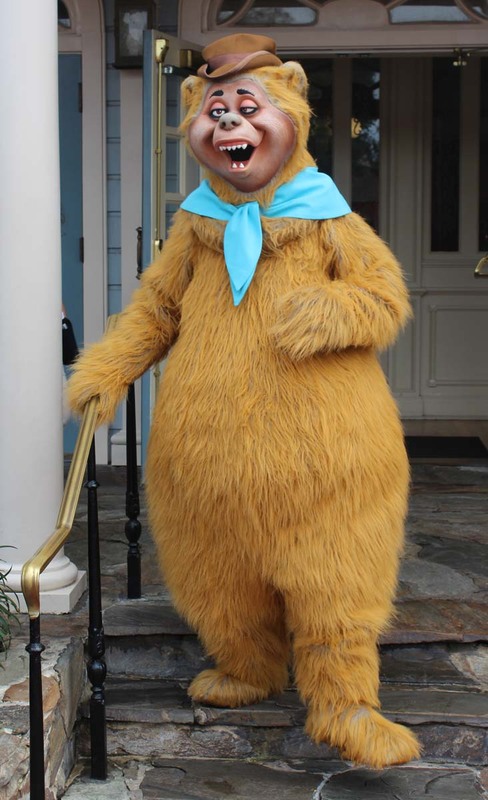 If Kelli goes on Mine Train with Maddie, Maddie will buy Mike (me) a toy. The flight was scheduled to arrive in Orlando at 9:26 but we landed early at 8:45. We were at Disney Magical Express 30 minutes later and little Madeline was thrilled to have her magic band screened to let us onto the bus. 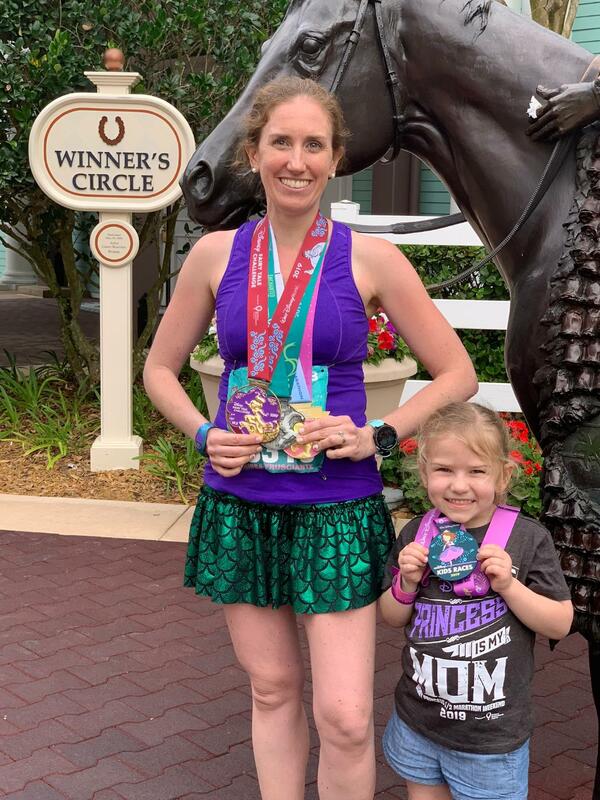 We waited 10 minutes before leaving the airport and then stopped at the French Quarter, Riverside and Old Key West resorts before arriving at Saratoga at 10:19AM. On the way over, I received a text that our room was not ready. At the Carriage House, we changed into shorts, stored our carry-ons with bell services and picked up a double stroller rental. An Epcot bus arrived a little after 11 and we were on our way to our first park. 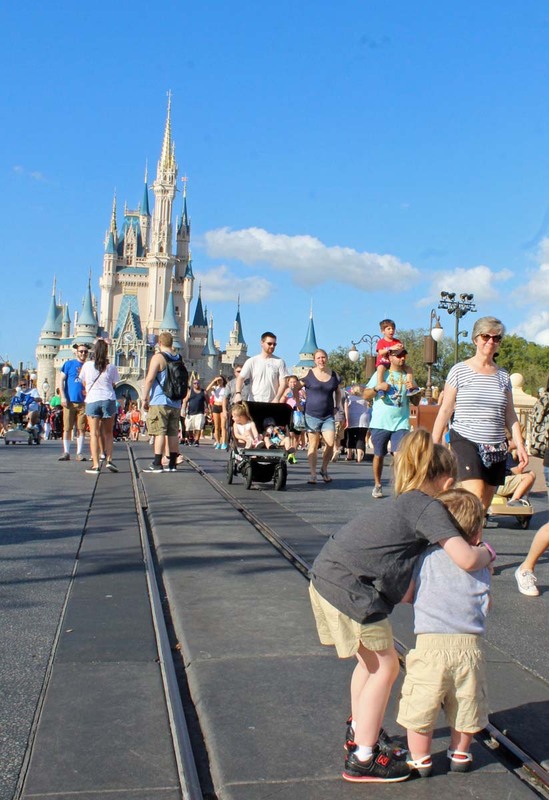 It was cute as Maddie and her mother were skipping to the Epcot entrance in their matching outfits. Lunch was at the Electric Umbrella. Kelli and I shared the Brisket Sandwich with beer cheese and French fries. Much better than the hotdogs and hamburger that you would get at other theme parks. 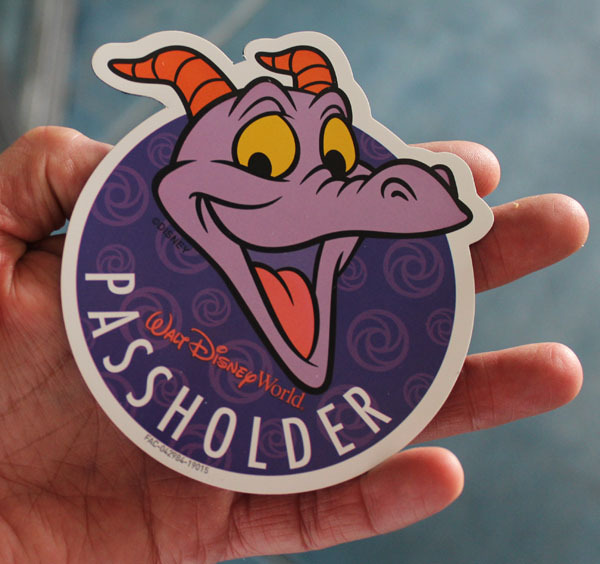 Kelli and Marissa went shopping in Mouse Gears before we finished lunch and came back with free Pass holder magnets featuring Figment. I had to run in and get mine. Caffeine was needed but the Starbucks line was too long at the Fountain View. Our first fast pass was for The Seas with Nemo & Friends. Surprisingly the FP line was long and standby was 45 minutes. Next was pictures with Bruce the Shark; Maddie did not cry this time. It looked like Turtle Talk with Crush would be starting soon, but they closed off the holding area just after we entered. Marissa and Maddie had fun with Mr. Ray’s Pop Quiz. The show was entertaining as always, Maddie did not get picked to ask Crush a question this time. I noticed that Dory says neener neener neener at one point in the show. I think it might be a new addition. We skipped our fast pass for Spaceship Earth to go on Soarin’ since Maddie was willing to try and the wait wasn’t bad. We set up child swap and Kelli and I along with Marissa and Maddie went in. Madie’s legs just stuck out in front of her in the seat. 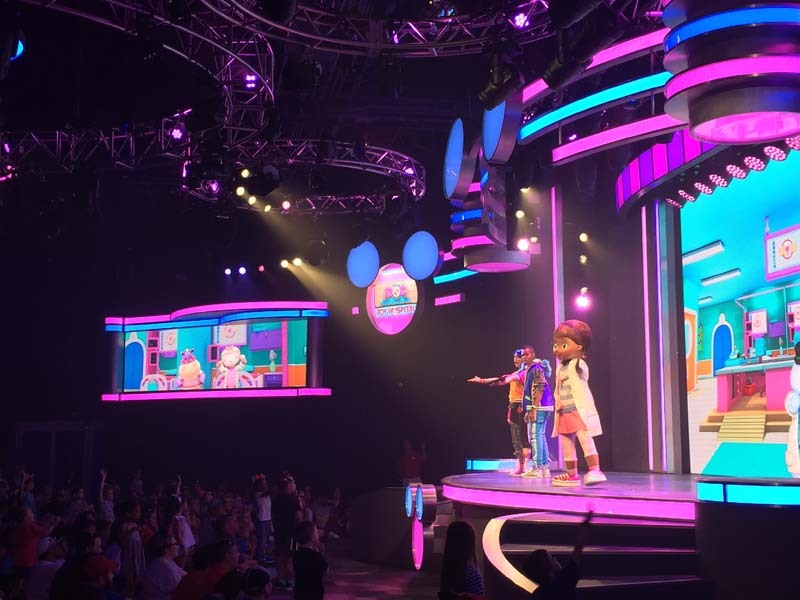 When the show started, Maddie was laughing, giggling, and enjoyed the first parts. After the ride, she decided not to go on again. I think the unexpected surprise of elephants throwing dust to change to the next scene, the waterfall and possibly the fireworks at the end made it “once is enough for now” thing. Tim, Kelli and I went on next and got center top row. 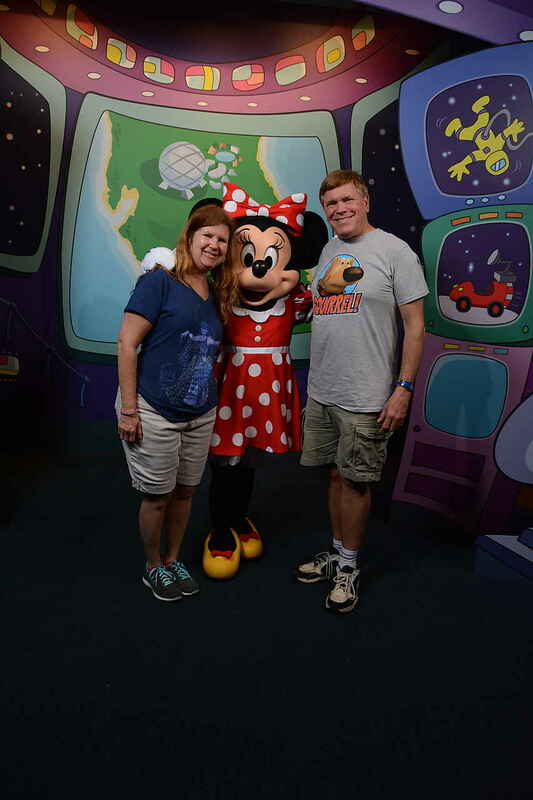 Mickey and Friends at the Epcot Character Spot had a moderate wait so we went in. 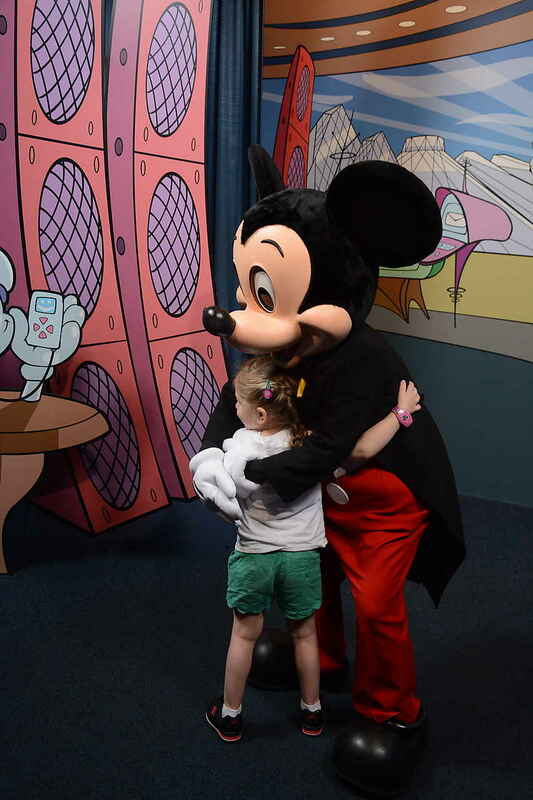 Maddie did great this time and even gave Mickey and then Minnie a hug. 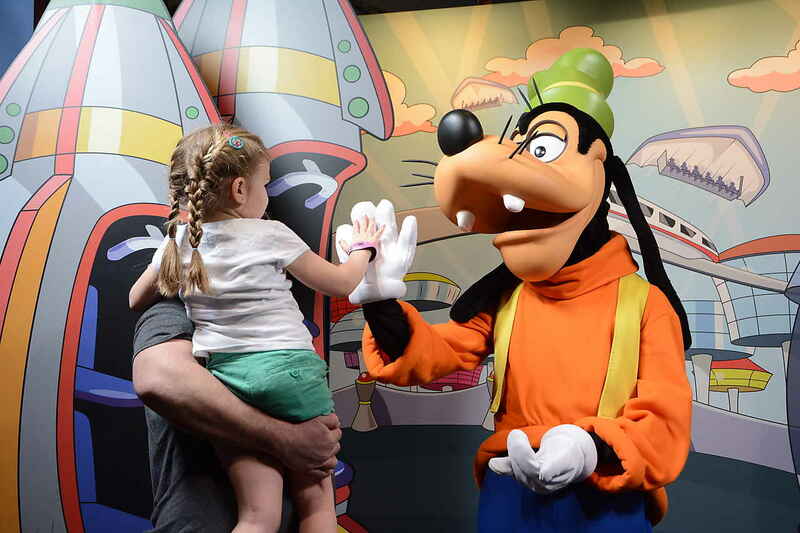 Liam on the other hand did get a little upset with Mickey and Goofy, but gave Minnie a high five. I got a text a little after 3 that our villa was now ready, room 2635. Maddie got a cake pop from Fountain View Starbucks for hugging Mickey Mouse while we all got a much needed caffeine fix. 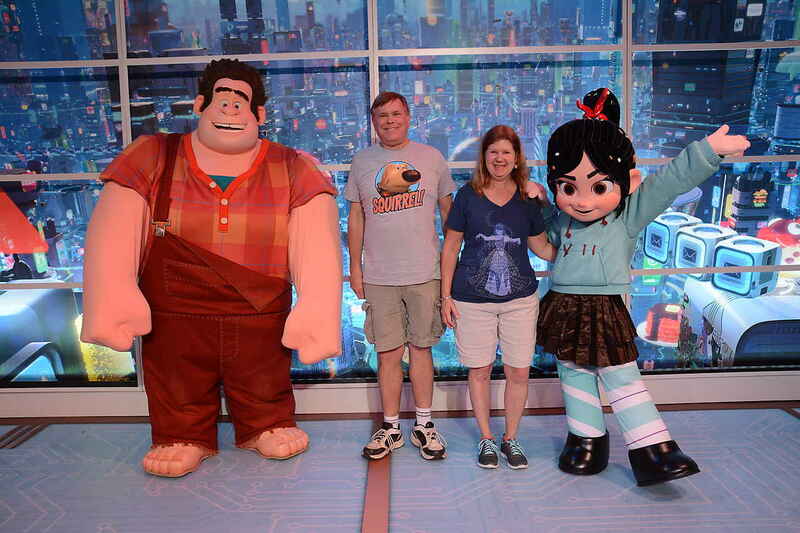 After a few wrong turns, we found Ralph and Venelope inside the Imagination Pavilion. 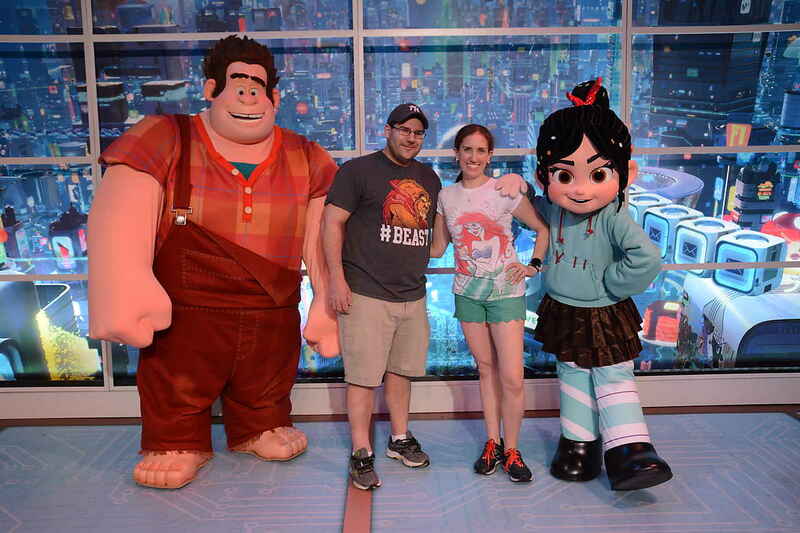 Maddie did not want to deal with big old Ralph but we enjoyed having our pictures taken with them. 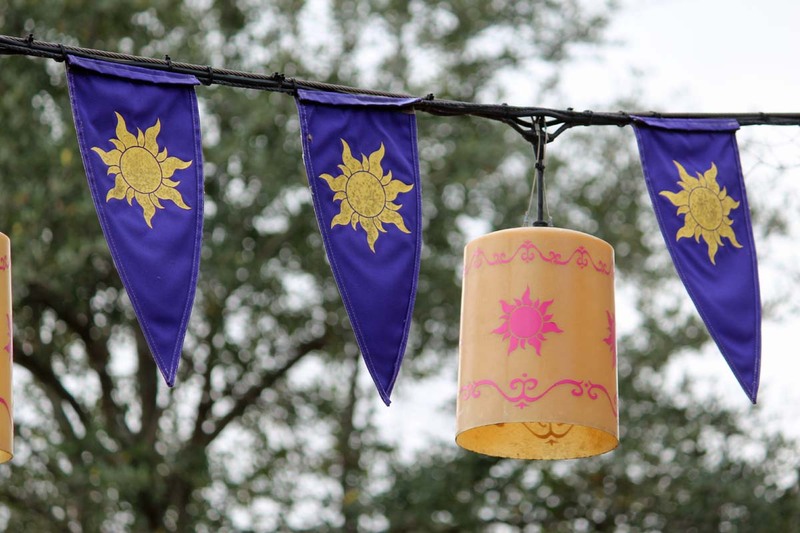 We made our way down to the World Showcase and Marissa purchased the Figment’s Brush with the Masters Scavenger Hunt. 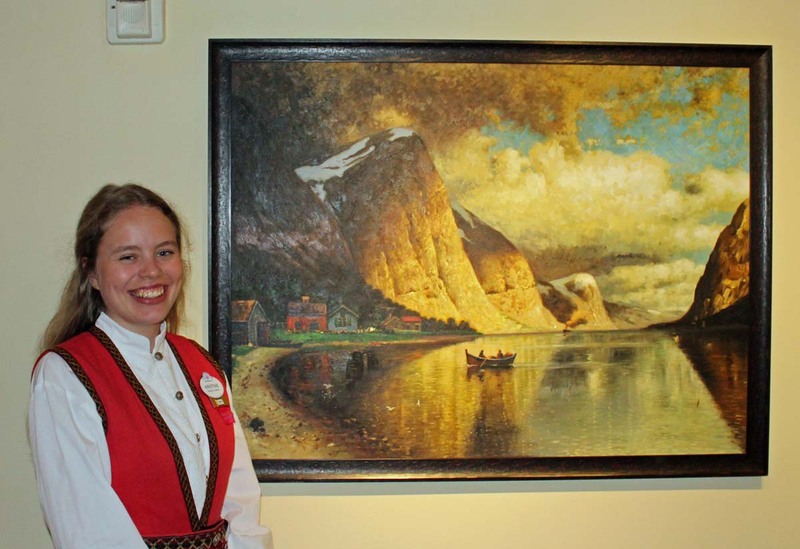 She had to find all the popular paintings that the mischievous little dragon is hiding in. 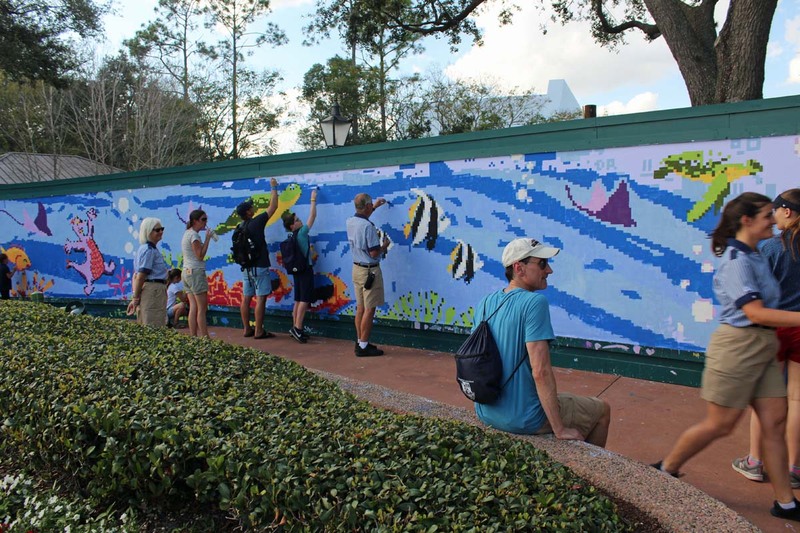 Glidden paints had an Expression Session section in which anyone could fill in the paint-by-numbers wall mural but we did not participate. 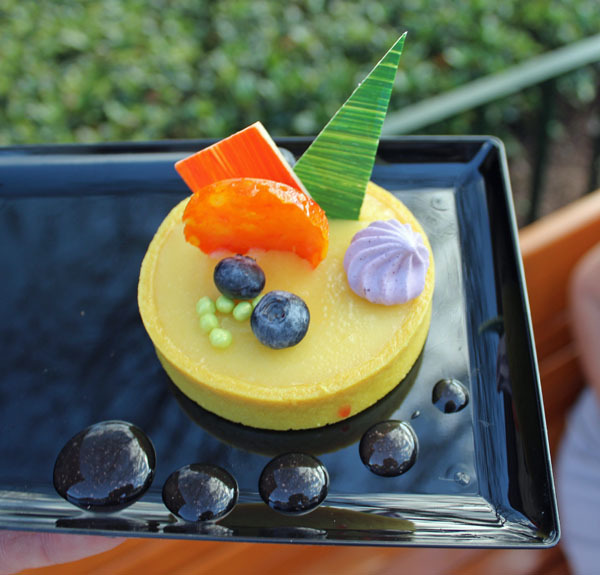 Kelli and I tried the White chocolate and Purple Sweet Potato Mousse and Lemon-Blood orange Tart from the Decadent Delights kiosk. 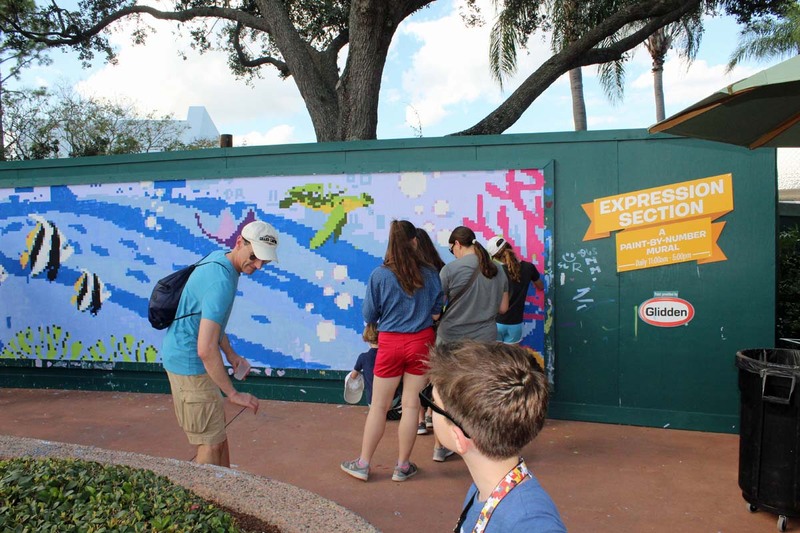 It was one of the Epcot Festival of the Arts Food Studios. 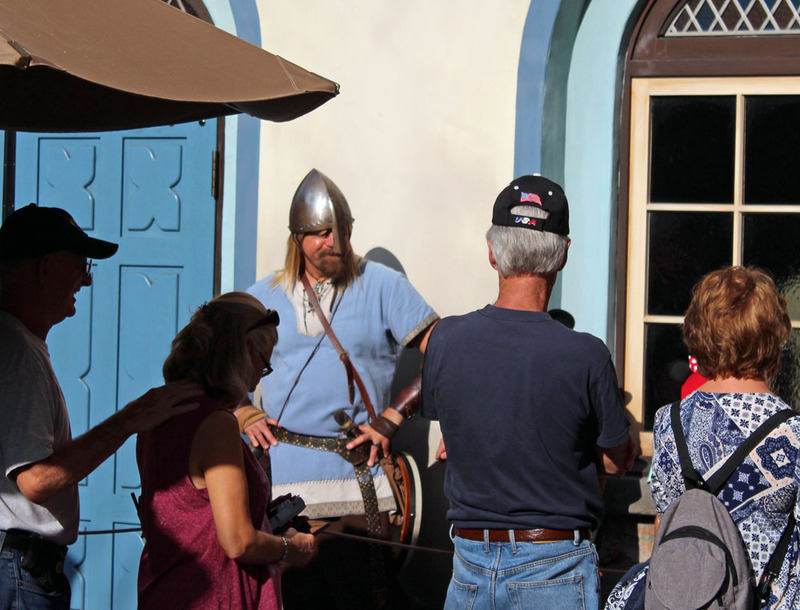 In Norway, I spotted a Viking interacting with the standby line guests as we went in using fast passes. 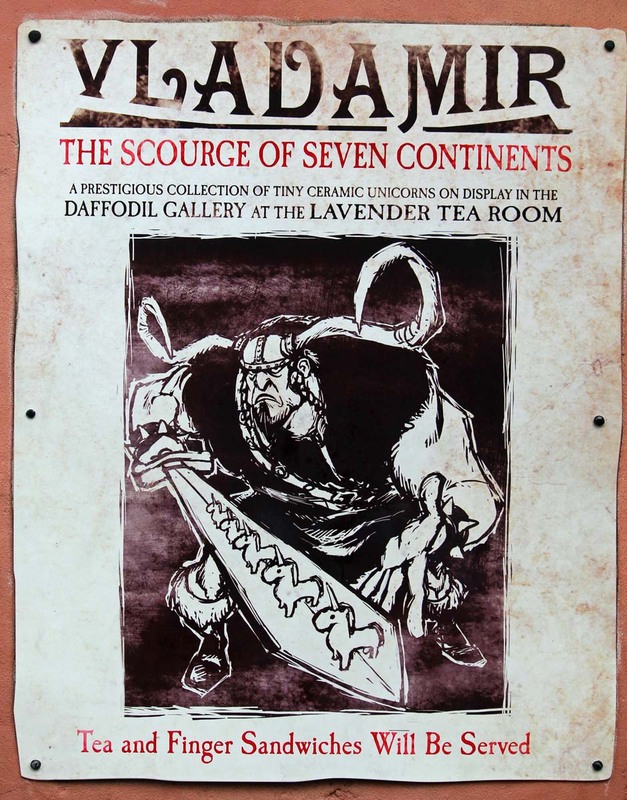 In the shop, I asked one of the cast members if the giant troll has a name. 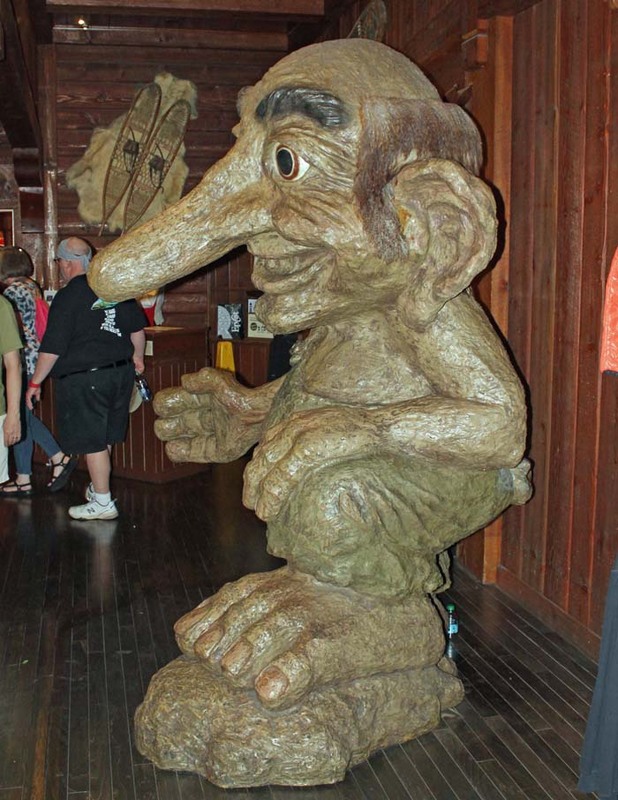 She said he was the “forgetful troll” and cannot remember his name; so the first guest of the day gets to name him, until he forgets it again for the next day. 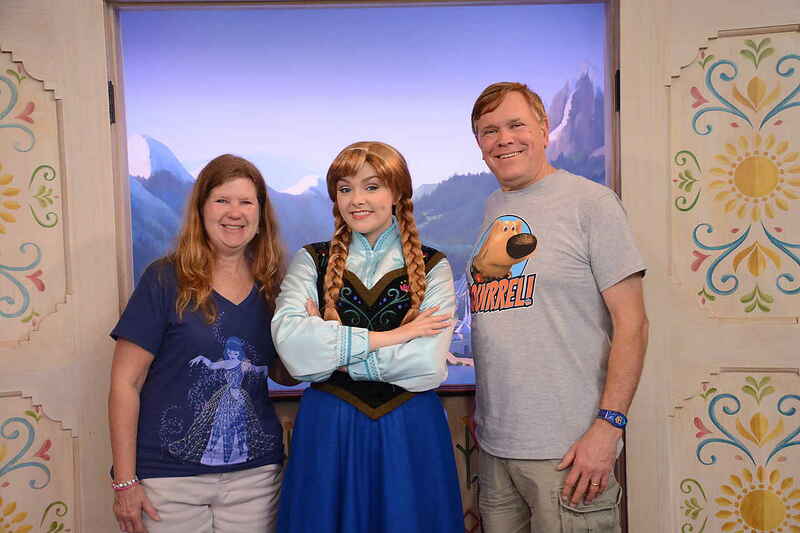 Meeting Anna and Elsa was fun. Look at this picture of Maddie and Liam looking through the rungs in anticipation to meeting them. 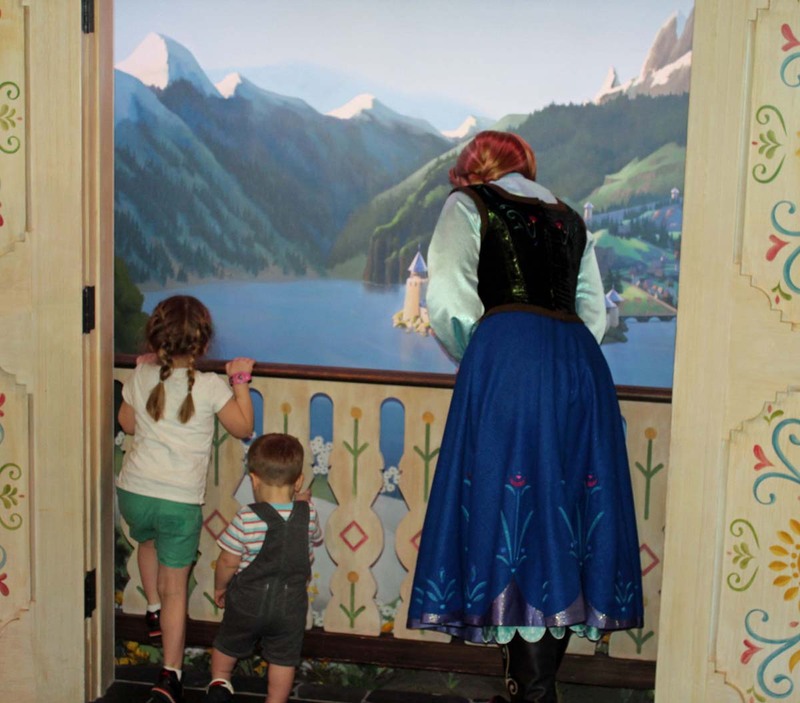 Liam was more interested in the balcony overlooking Arendelle so Anna took Maddie over to Liam so they could look together. 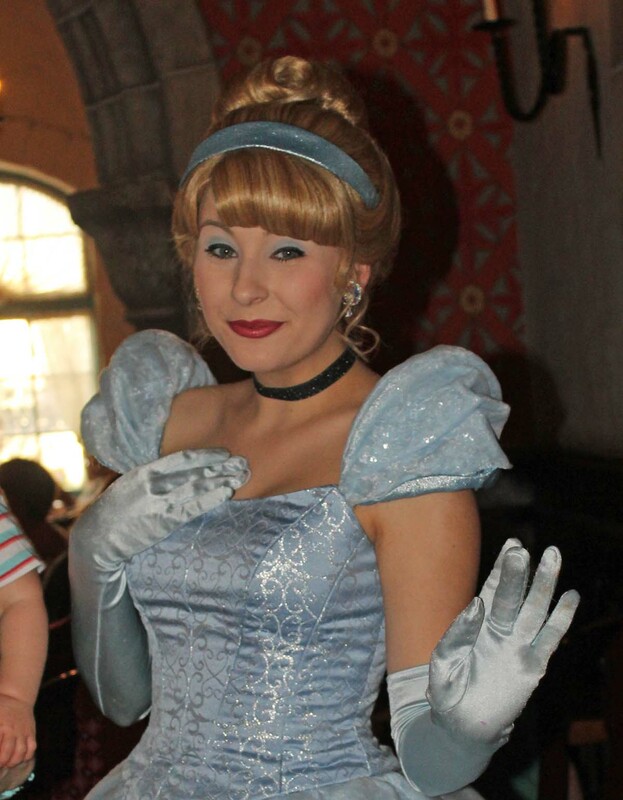 Maddie forgot to ask Elsa if Marshmallow still has her Frozen tiara, so I did! She said Marshmallow still has it and is very happy with it. 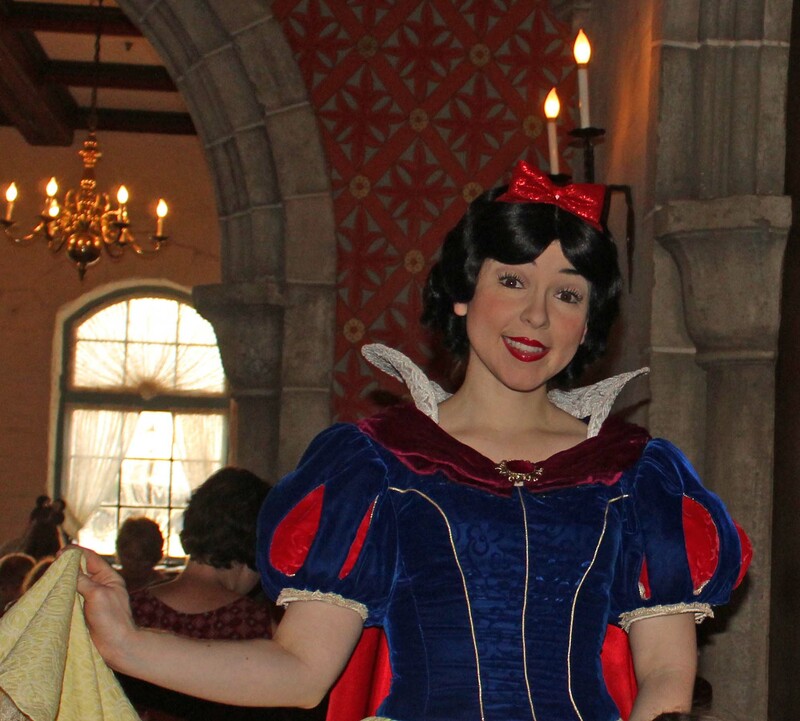 Dinner was at Princess Storybook Dining at Akershus Royal Banquet Hall. 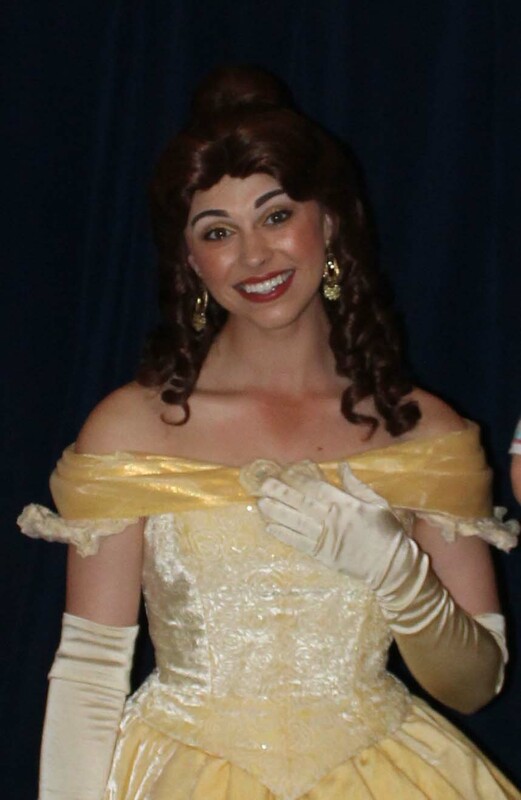 We took photos with Belle before seating. For drinks, I tried the Oslo, made with strawberries, crème de banana, linie Aquavit and vodka. Tim had the Einstok toasted Porter. I love the Gjetost cheese found in the Taste of Norway, an assortment of cold appetizers you can have before your meal. Entrees included the Viking Mixed Grill (fillet of salmon, Norwegian meatballs and grilled vossakorv sausage), Gluten free salmon, and Grilled Fillet of Salmon. 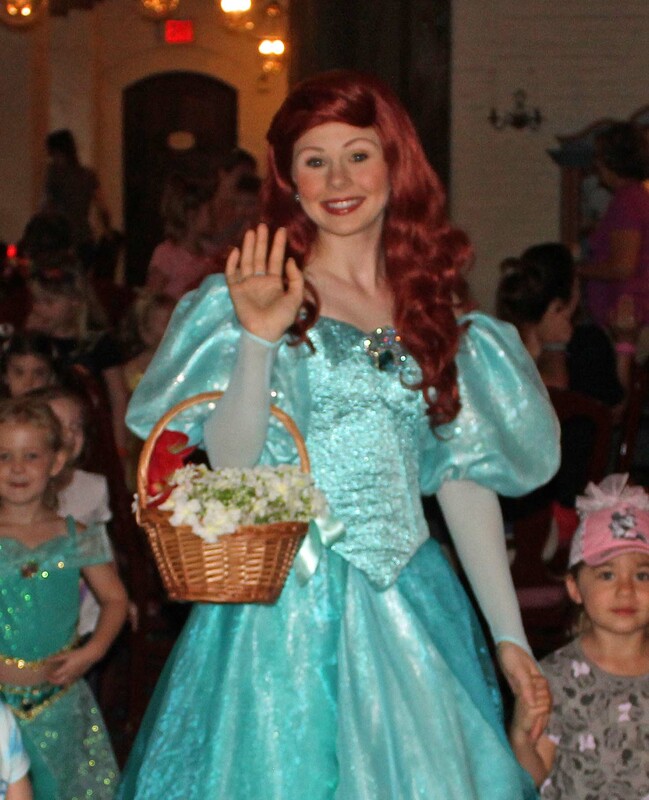 Cinderella, Sleeping Beauty, Ariel, and Snow White visited the table. 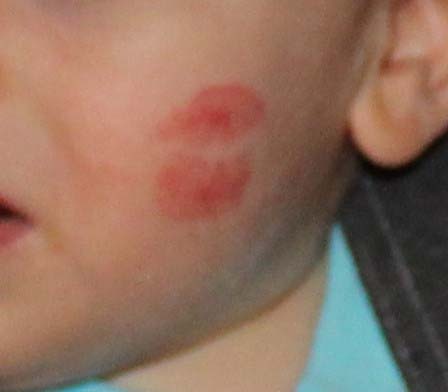 Liam got a kiss on the cheek from Ariel. 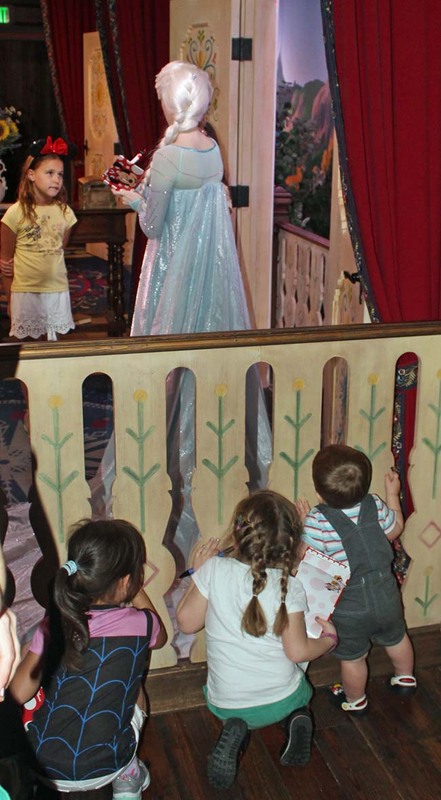 They also had a Princess Parade where Maddie walked with Snow White. 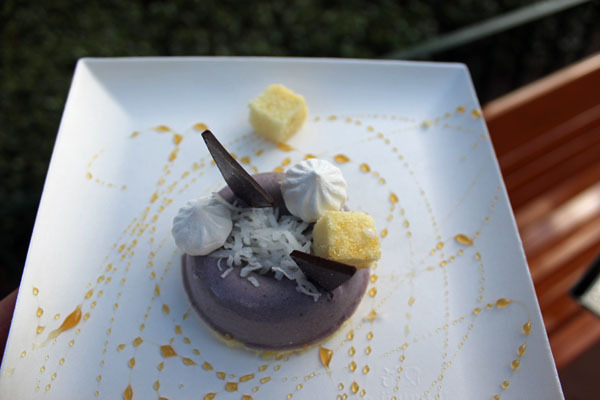 The dessert trays featured chocolate mousse, traditional rice cream and apple cake. Marissa was offered a plate of gluten free cookies. The Tables-in-Wonderland took $61.50 off the bill that totaled 313.74 with tax and tip. 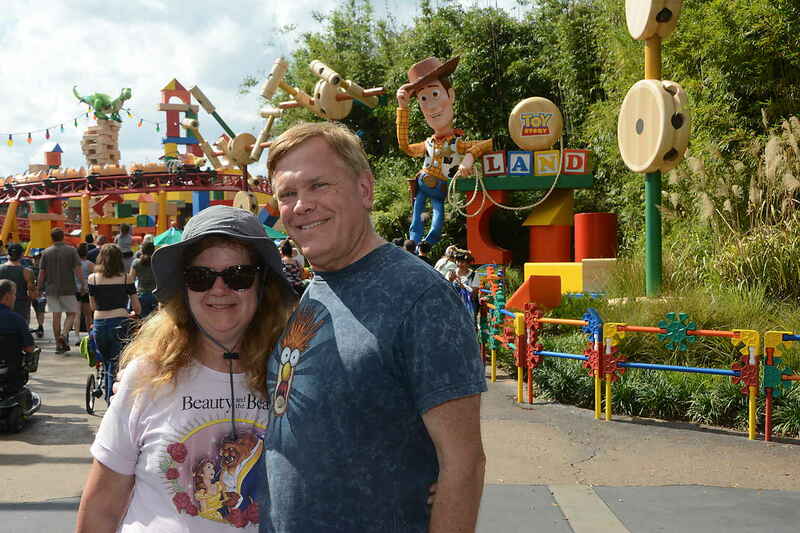 After dinner, Kelli and I shared a drink from the China Tea Cart – Tipsy Ducks in Love – bourbon whiskey, coffee, black tea, cream and chocolate syrup. It was like a chocolate milkshake with a kick of alcohol. 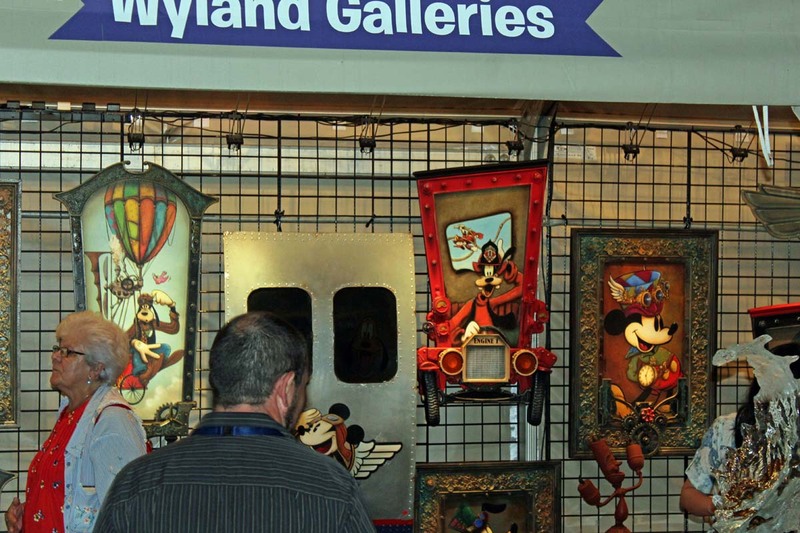 The World Showcase featured many Festival of the Arts booths and we loved looking in them enjoying some great artistry. We stopped briefly to listen to Disney on Broadway near the American Pavilion. We heard songs from High School Musical, Tarzan, and Beauty and the Beast sung by Ashley Brown and Josh Strickland. In Morocco Marissa and Maddie enjoyed the Kidcots station. 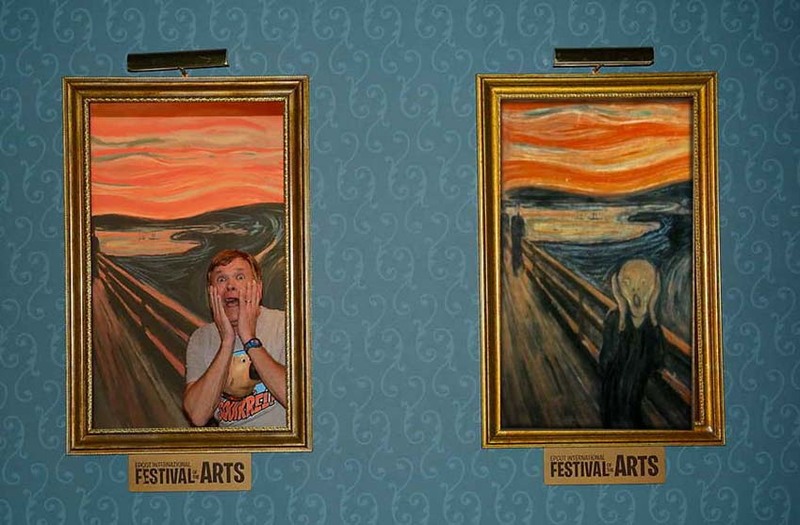 We were able to take pictures of us inside a Peter Pan book, and the famous Scream painting. 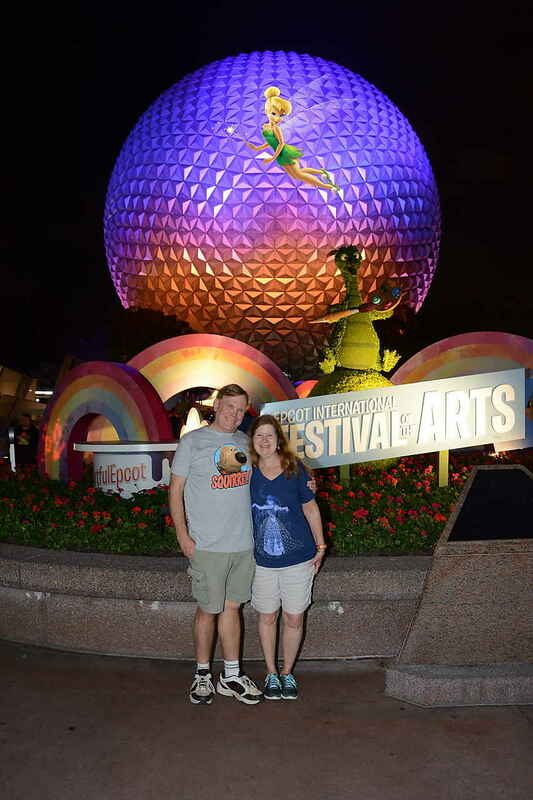 We ended the night with some photopass pictures in front of Spaceship Earth and left Epcot around eight. The girls and Liam got off the resort bus at the Congress Park section to head to the room while Tim and I stayed on until the next stop to get out luggage at bell services and pick up our Garden Grocers order. We got a ride back on a stretch golf cart by bell services. The two-bedroom villa had plenty of room and Maddie and Liam had fun running room to room and exploring. The balcony overlooked the courtyard and Disney Springs across the lake. We stored a week’s supply of breakfast and lunch and unpacked our suitcases. I think I was asleep before my head hit the pillows. I woke early and made some bacon, which got the others up. Kelli and I had breakfast out on the balcony. Maddie and Liam joined us for a while. We made sandwiches for lunch and packed them for the park along with lots of bottled water. This is a nice way to save money so we can enjoy eating some great sit down dinners. Today we hit Magic Kingdom and arrived right at opening at 9 AM. 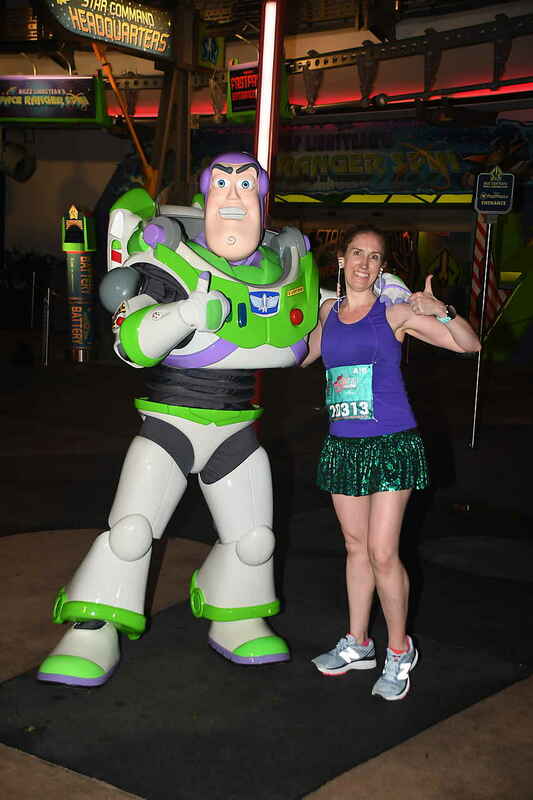 Our first attraction was Buzz Lightyear's Space Ranger Spin. 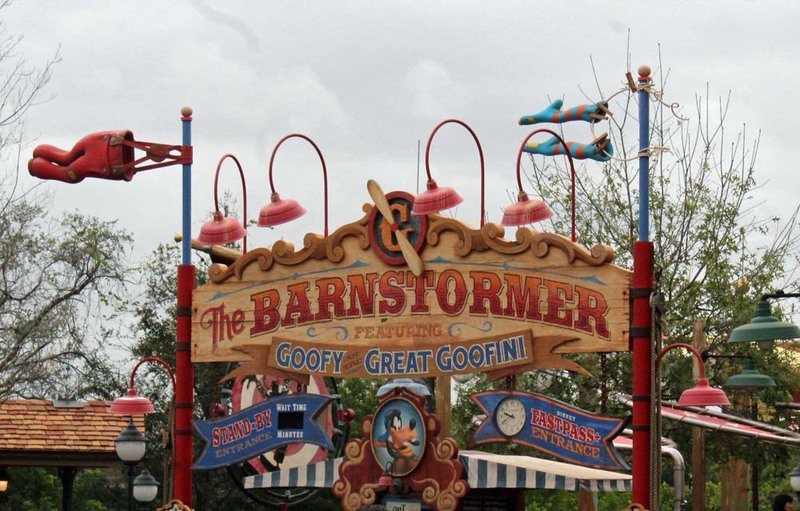 We then headed to the Barnstormer featuring the Great Goofini, one of Maddie’s favorites. We noticed a lot of food shaped souvenirs for sale. Kelli watched Liam as the rest of us went on. 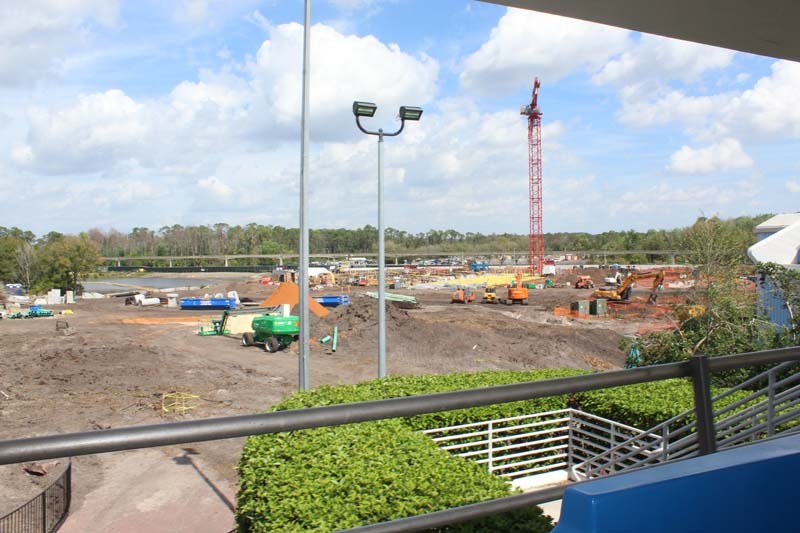 The queue for the Barnstormer gave good views of the construction area for the new Tron Light-cycle attraction. 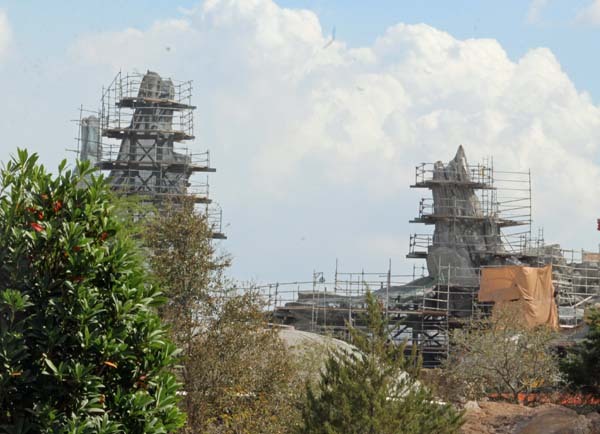 I noticed a lot of mildew on Space Mountain. You don’t see this from the side that faces most of the crowd. The roller coaster was fun but short. 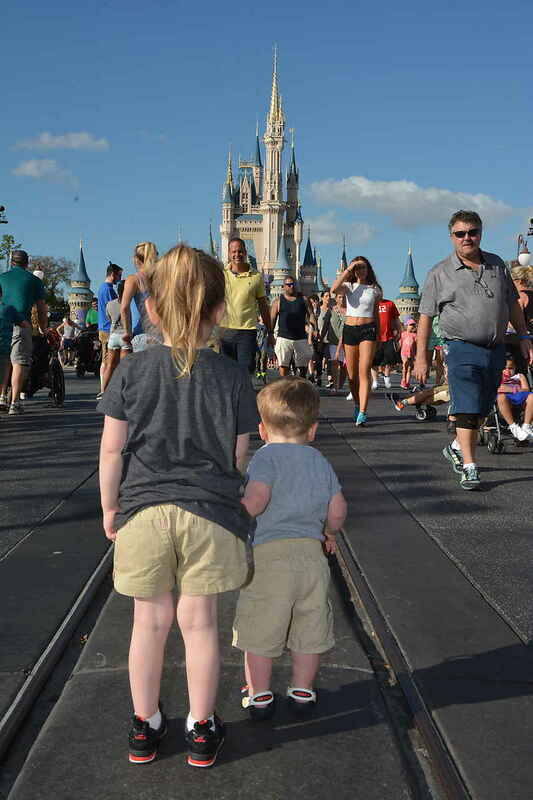 Of course, Maddie wanted to go on but the wait was once enough for us. Across from the Ariel ride, I noticed a Mourning Dove nest in a tree and pointed it out to Kelli and Maddie as Tim parked the stroller. 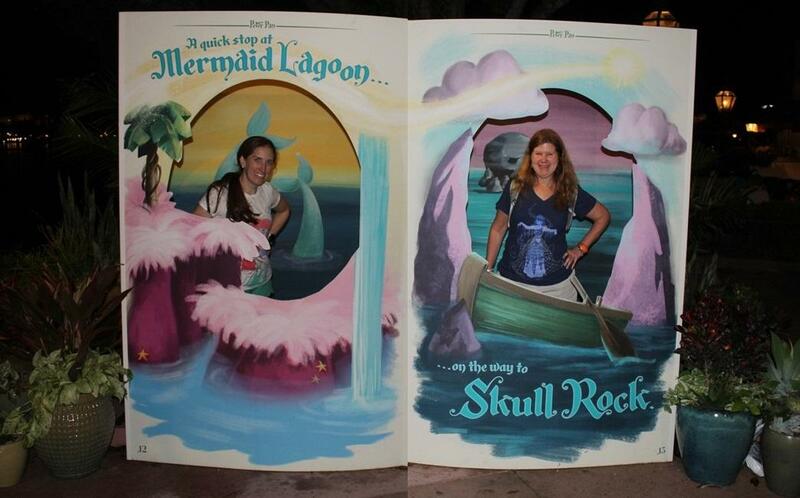 We all rode Under the Sea: Journey of the Little Mermaid and I got some nice video of the ride. We found a Photopass photographer and asked for a magic shot and we had pictures taken with Lumiere. 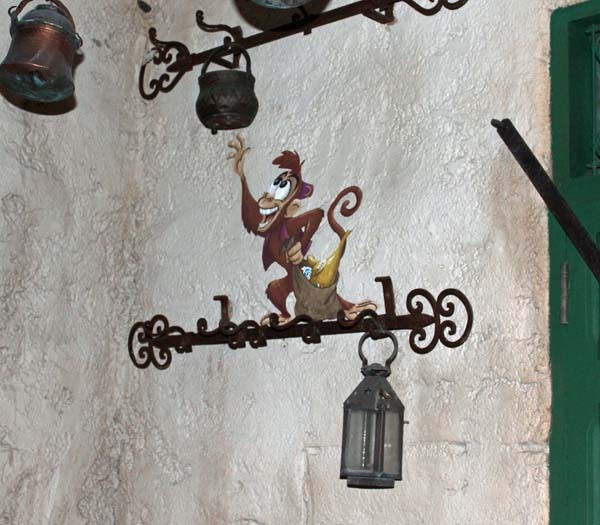 We made our way through the crowds for Peter Pan's Flight using Fastpass. 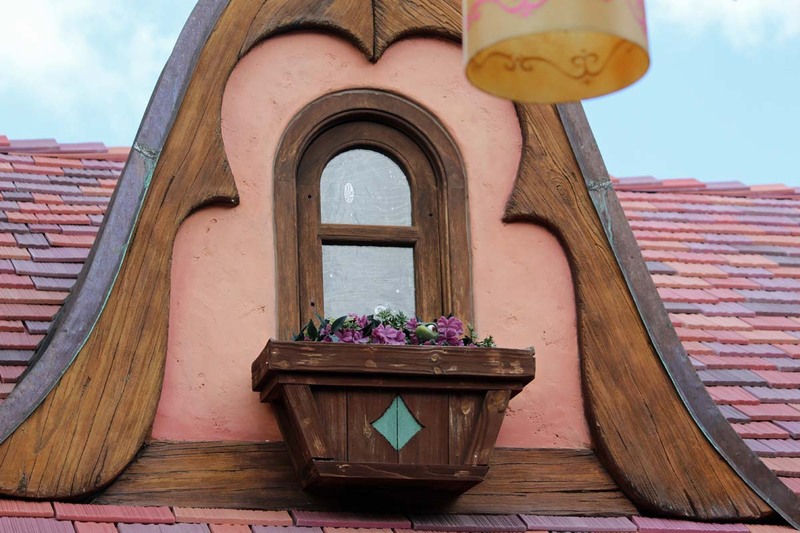 Then it was a much-needed break at the Rupunzel bathrooms. 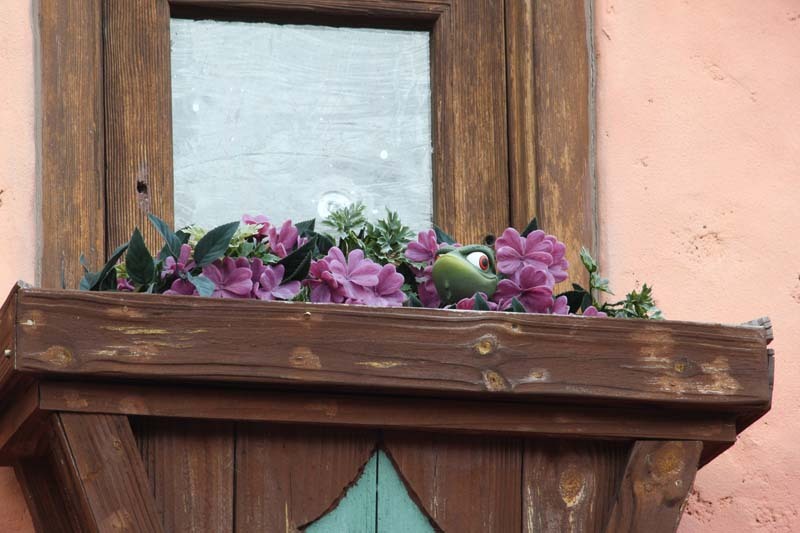 We were able to find the hidden Pascal along with a bag of apples for Maximus and of course the frying pan; who knew? 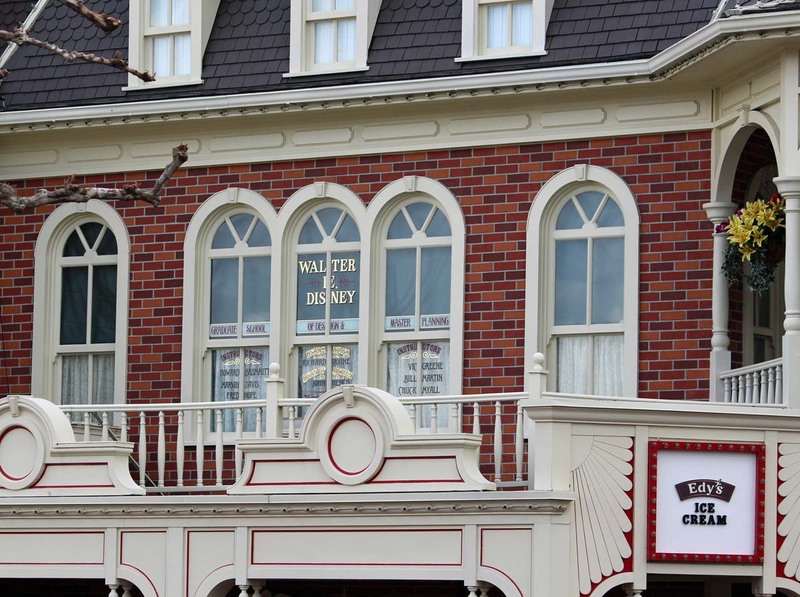 Starbuck was calling us and I got a picture of Walt Disney’s window above the ice-cream shop while waiting for others to come out. 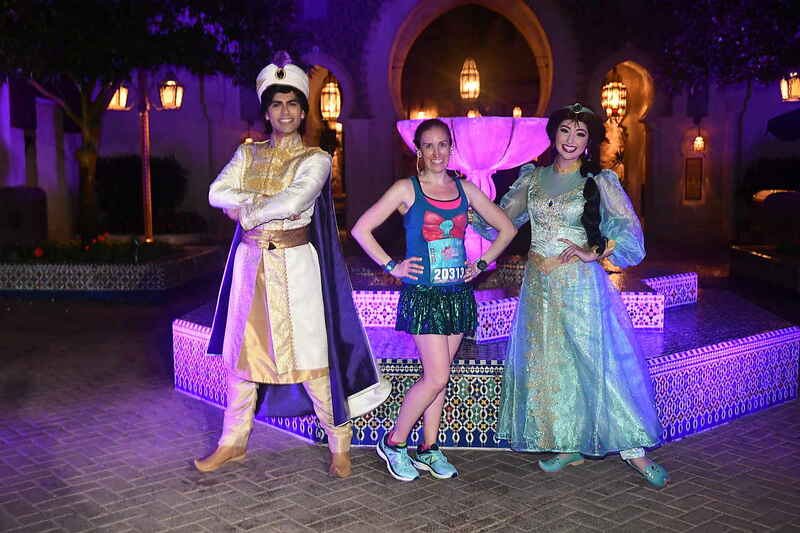 We found a photopass photographer for some pictures in front of castle. The sky started to darken and we needed a place to sit for lunch. 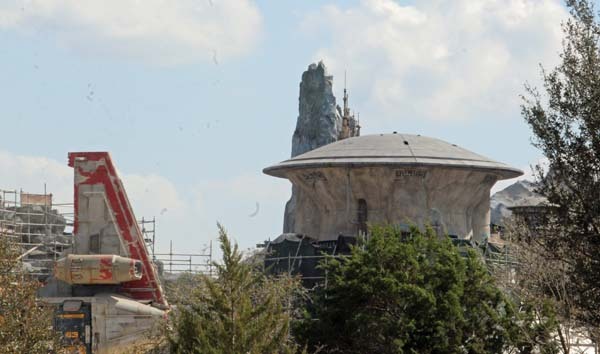 I knew the Tortuga Tavern has some covered seating. 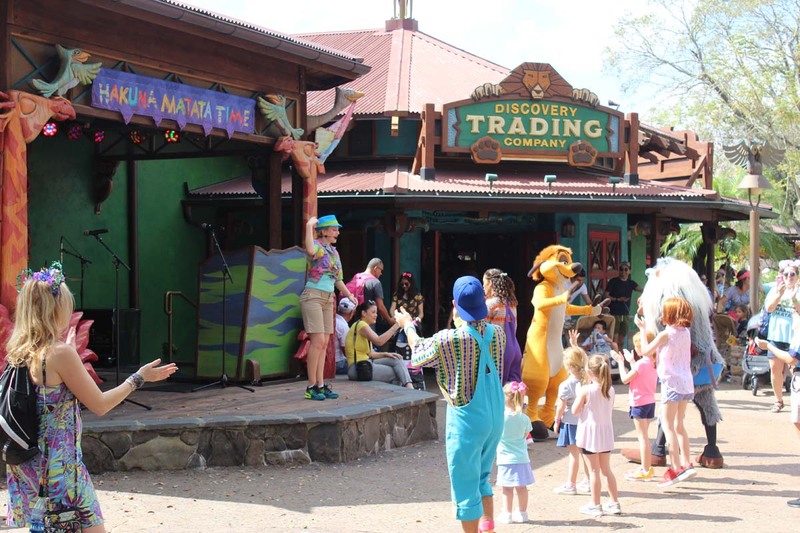 We made our way over to Adventureland and saw some of the 11:30 castle show. We just beat the rain as we settled down to a table at Tortuga Tavern. We watch everyone scramble as the rain and wind picked up, then downpour. People watching can be fun. Marissa met friends while we had our packed lunches. Tim and Marissa took the kids on Pirates of the Caribbean while Kelli and I stayed back. I was still hungry so tried the Chipotle Barbecue Short-Rib with a fountain soda from the tavern. 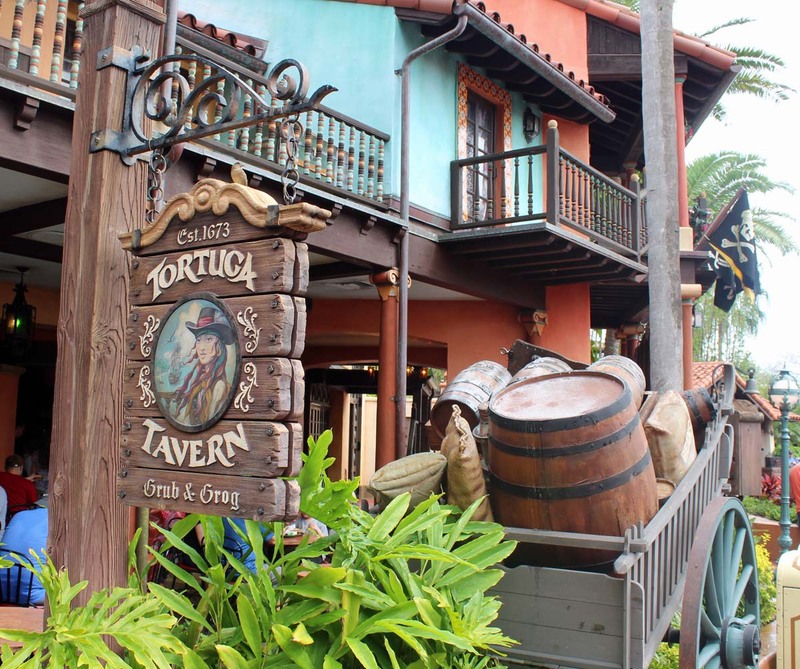 Tortuga Tavern is only open when the crowds are high, as it is during President’s week. That might explain why my fountain drink had the distinct flavor of being made with unfiltered Florida water. The hydrogen sulphide (sulfur water) gave my diet coke an awful swampy flavor. We did some shopping in the Pirates Bazaar where I found a great pirate shot glass. 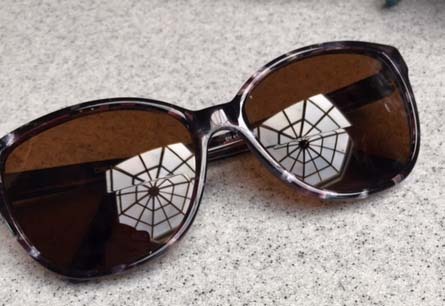 The inside is the shape of a skull. 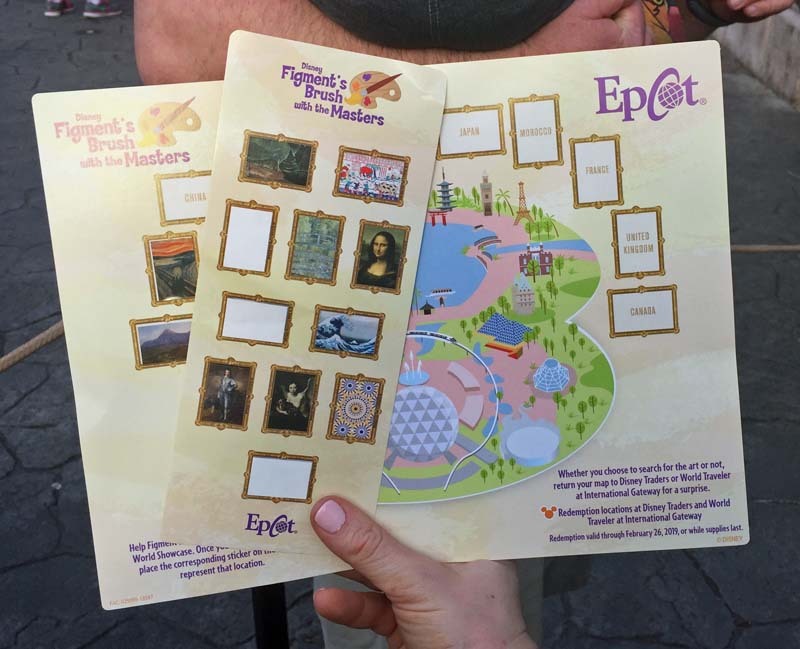 Next, we looked for pins in the Trading Post where I picked up some exclusive DVC pins. Maddie convinced Kelli to buy her a polished rock shaped like an egg. 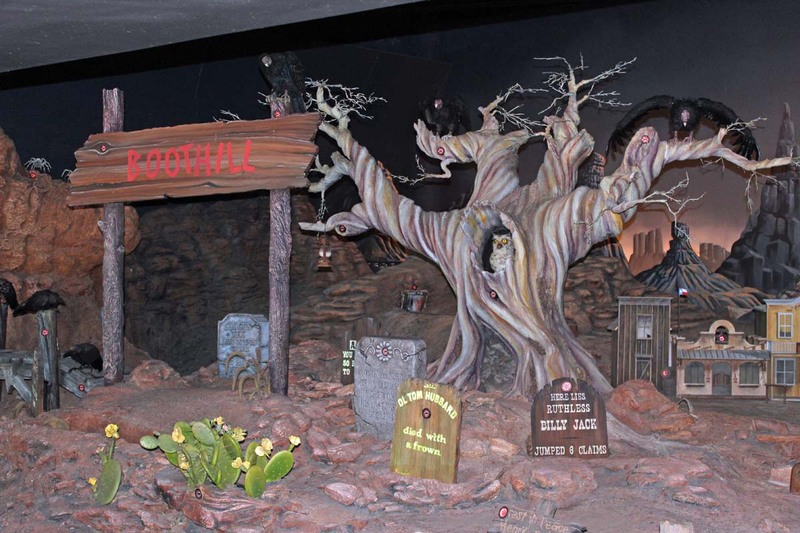 We passed by the Frontier Shootin' Arcade and I could not resist shooting some fun targets. The Muppets were performing the Ride of Paul Revere in Liberty Square while some of us browsed the Ye Old Christmas Shoppe. 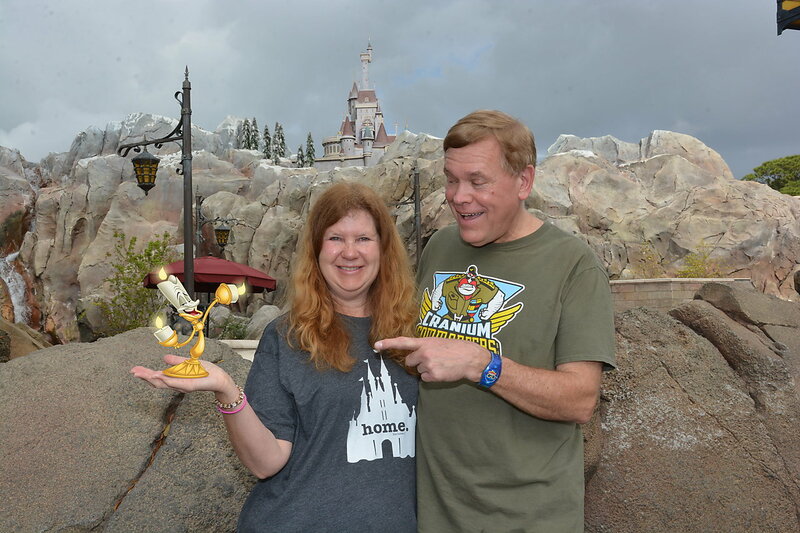 We did pick up the Mickey’s 90th birthday key ornament. Tim texted us that he had found Mary Poppins and was now on line. This meet and greet is hidden so the line was not that long. 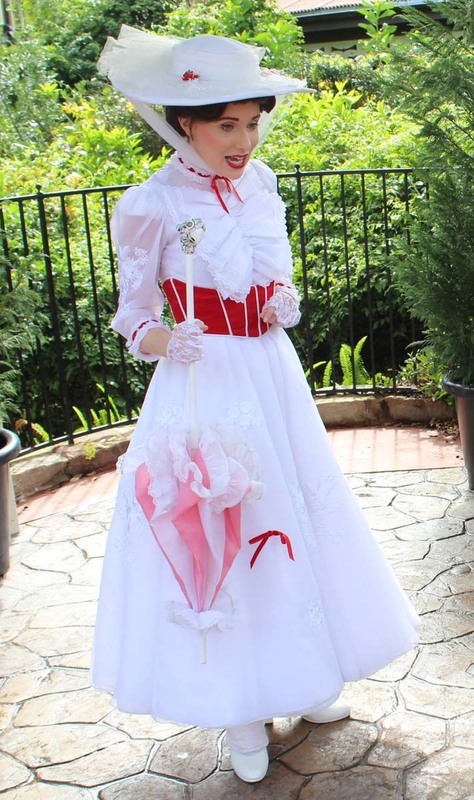 The pictures came out practically perfect in every way. Our fastpass for the mine train was approaching. 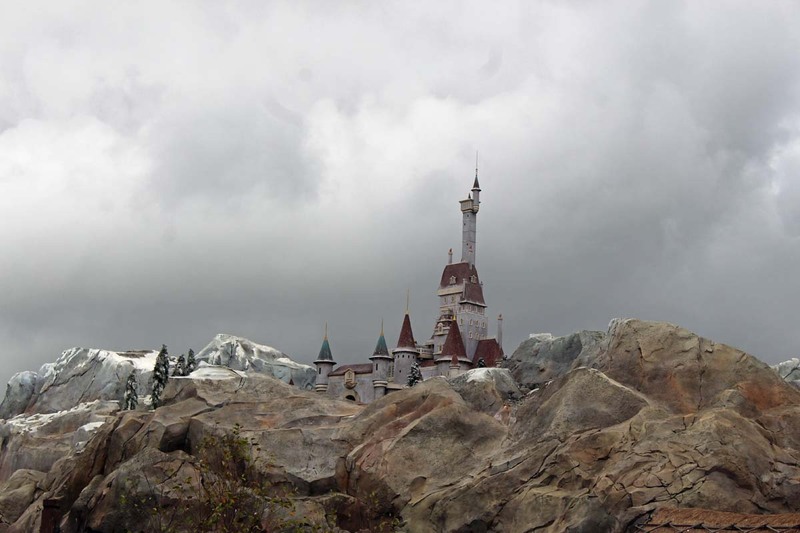 We made our way up the side of the castle and passed the Sword in the Stone show in front of carousal. 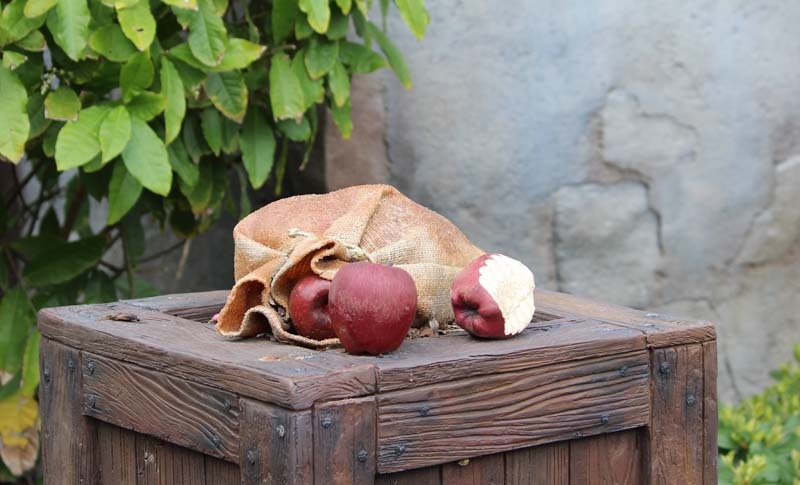 Kelli did not go on the Seven Dwarfs Mine Train with Maddie. Tim sat with her and she enjoyed it. Maybe Kelli will go on next time – probably not. 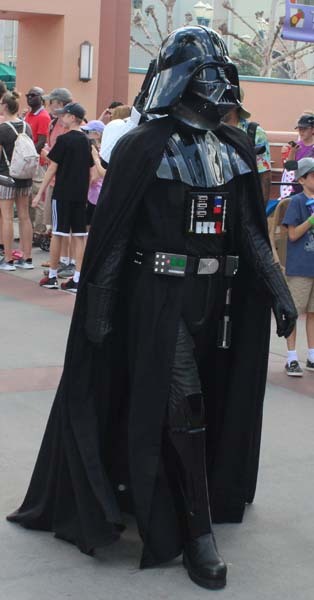 We did some shopping in Sir Mickey and I saw the Sorcerers of the Magic Kingdom card game in action outside. 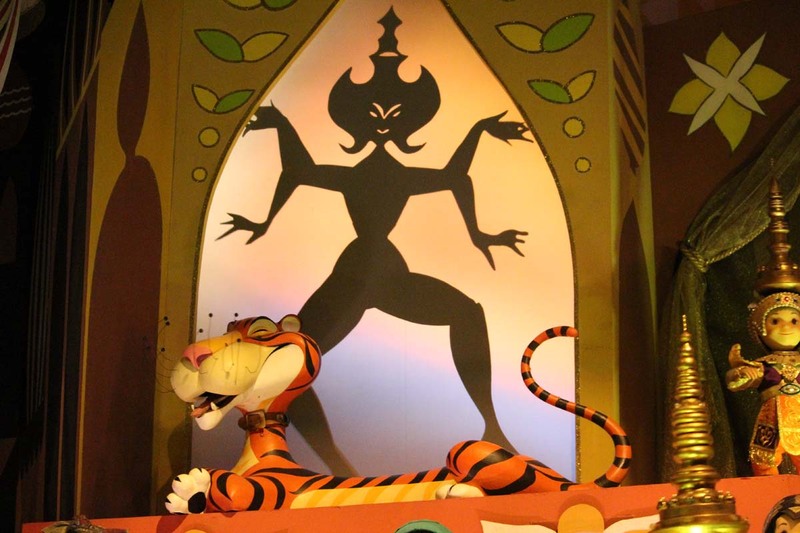 Next was a ride on it's a small world. 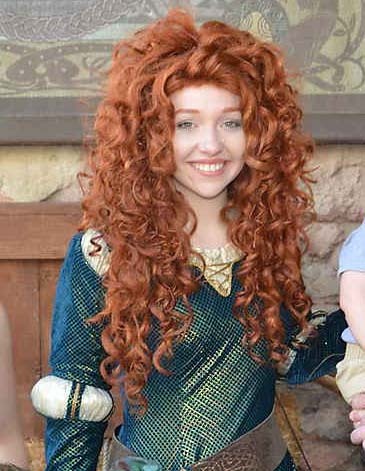 We crisscrossed the Kingdom riding it’s a small world then meeting Merida. 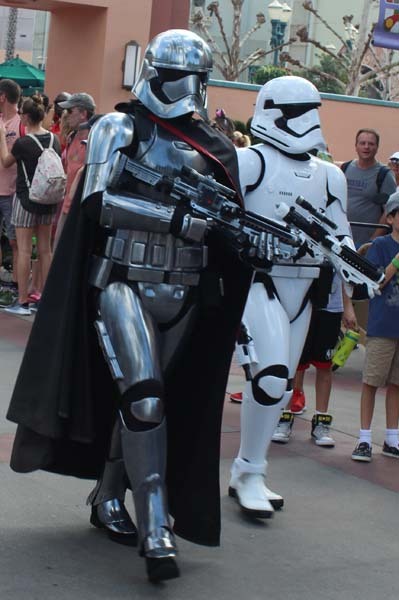 This was followed by more pics in front of castle followed by shopping in the Emporium. 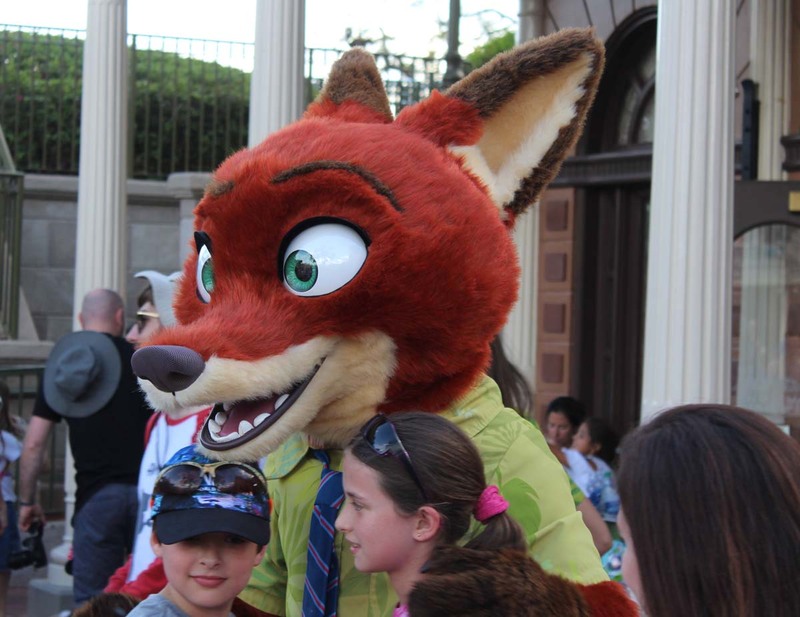 The Dapper Dans had just finished a set in the square when Nick and Judy Hopps appeared. 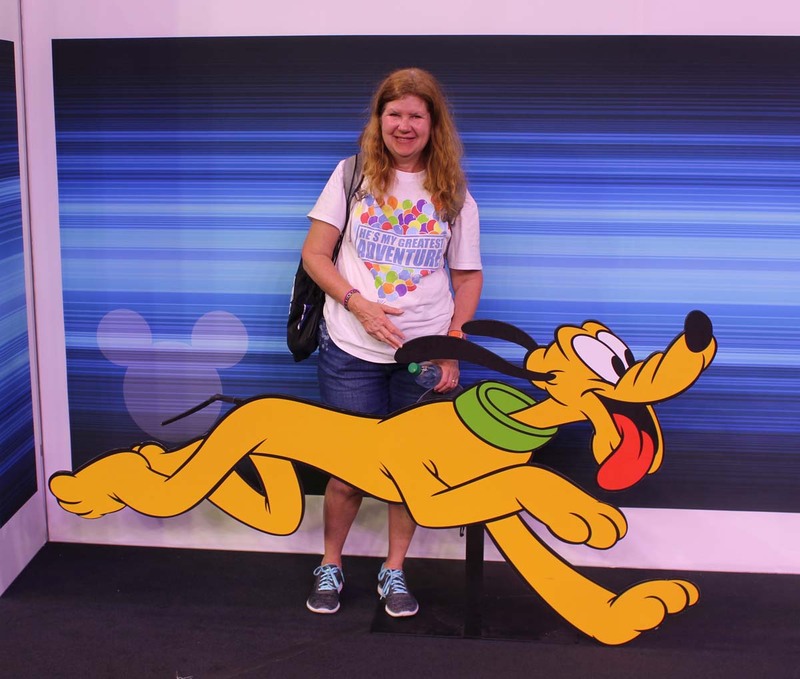 Dinner was at the Wave – of American Flavors so we walked over to the Contemporary. We were early so did some shopping on the third floor before checking in. At the bar, I had the Pina CoLava and got Tim a Kona Seasonal draft. For dinner, appetizers included Tuscan Sausage Soup, Strawberry and goat cheese salad, and Bacon and Eggs (maple-lacquered pork belly with perfect egg and Tillamook smoked cheddar grits). Entrees included Braised Beef Short Rib (roasted garlic potato purée, winter vegetables, peppadew vinaigrette), Gluten Free Short Rib, Sustainable Fish of the Day (Carolina gold rice perlou with Port Canaveral rock shrimp, crab beurre blanc), and Grilled Beef Tenderloin (potato gratin, jumbo asparagus, red wine reduction). The kids had the grill cheese and cheeseburger. We were too full for dessert; but when we got back to the resort we stopped at Artist Pallet for a Mickey bar, brownies and a purple passion cupcake. We also did some shopping. I picked up a Jessica Rabbit - she’s not bad pin and a DVC car magnet. When we walked back to the villa, Kelli and I heard a strange bird call coming near the water in the dark. I could not identify it. It took me a day to figure it was a Wood Stork. Breakfast was again on the balcony enjoying the beautiful Florida weather. It’s been quite warm for February with lows around 68 but highs in the high eighties. It feels like summer weather. 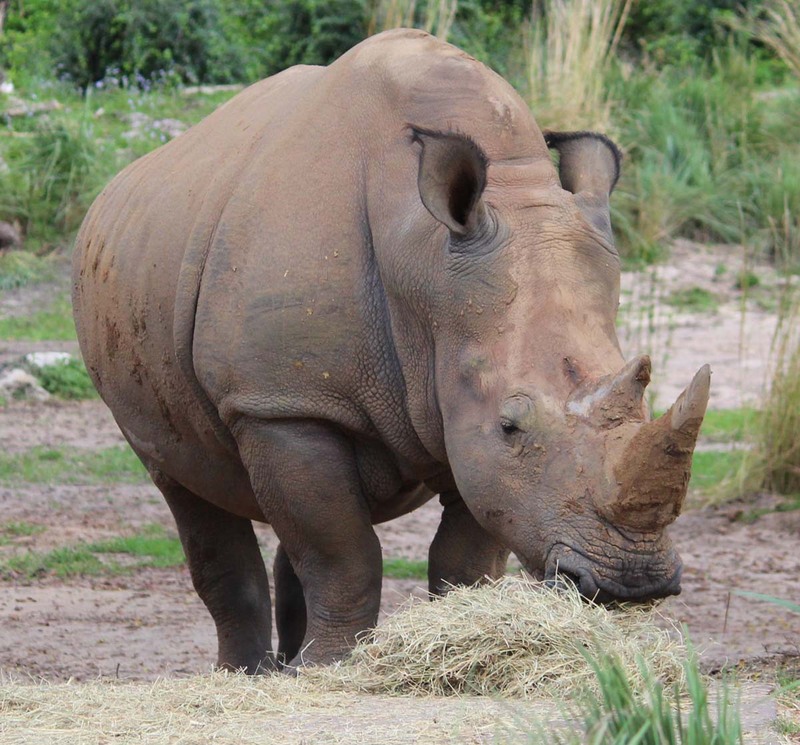 We headed for Disney's Animal Kingdom Theme Park, but missed a bus and had to wait 20 minutes. We were hoping to be near the front of the line for Flight of Passage. When we got there, the line was quite long already. Marissa, Tim and I headed for the end of the line while Kelli looked after Maddie and Liam. The line looped back to the Festival of the Lion King then back. It took us 30 minutes to get to the fast pass merge, then another 15 to walk up the mountain to the pre-show. 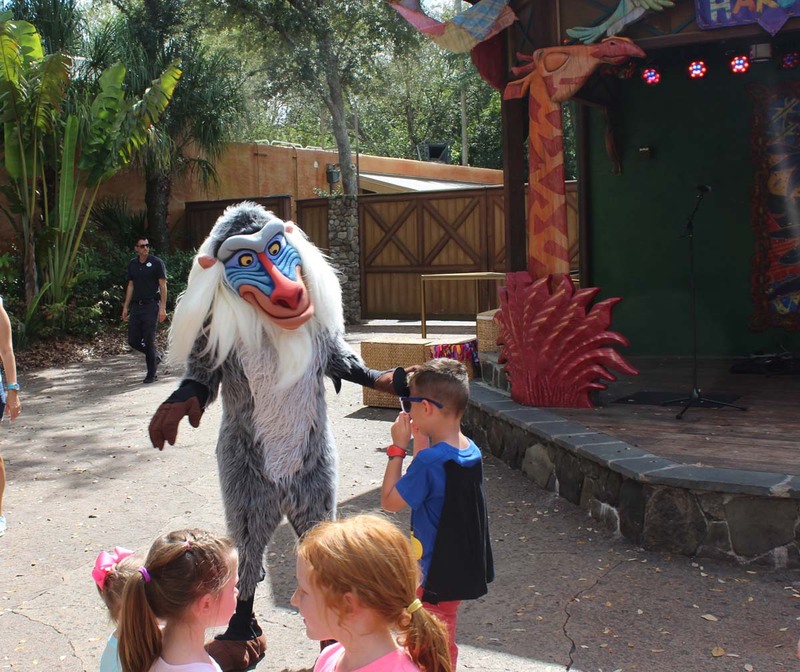 During this longer than expected wait, Kelli and the kids watched the Na'vi drummers. Then she brought each a toy banshee (an Ikran in the native Na'vi lanquage); a green flying one on a stick for Maddie, and a blue soft plush for Liam. Maddie's banshee went through a number of names, but finally settled on Norbert Jr. 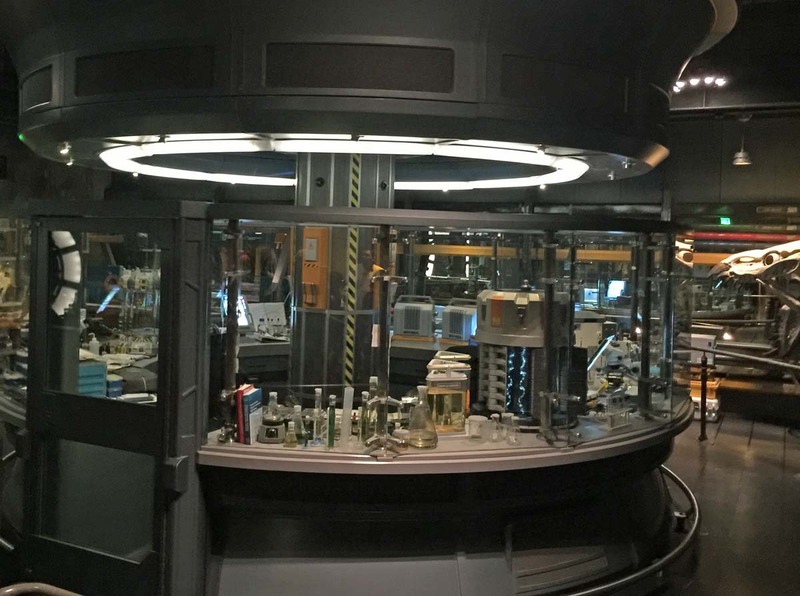 The queue inside for Flight of Passage was fantastic. I loved the avitar in the tank and these little morphing liquid sea urchins. The preshow was too long but the feeling of riding a banshee thrilling. A great ride! I was worried about fitting on the ride but was limber enough to squat on the back of the banshee/ikran just fine. We made the obligatory stop for Starbucks in Creature Comforts. 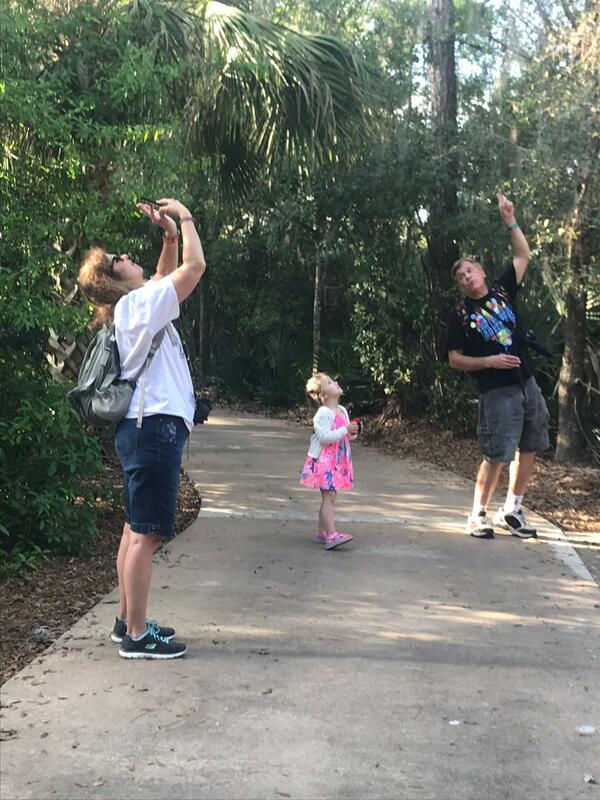 I grabbed a frozen banana from a cart outside and took Kelli and Maddie to look at some Cotton-Top Tamarins across the path. Maddie and I signed up to become Wilderness Explorers. 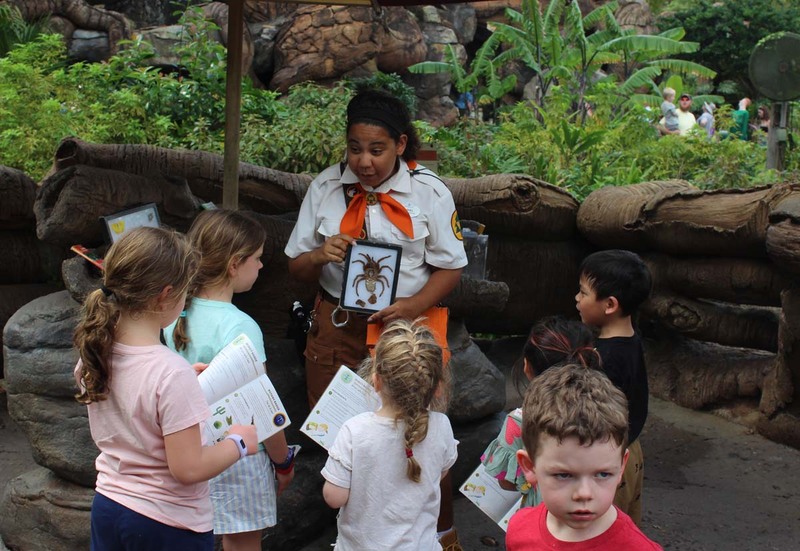 We took the pledge and got our Wilderness Explores guide near the entrance to Discovery Island. 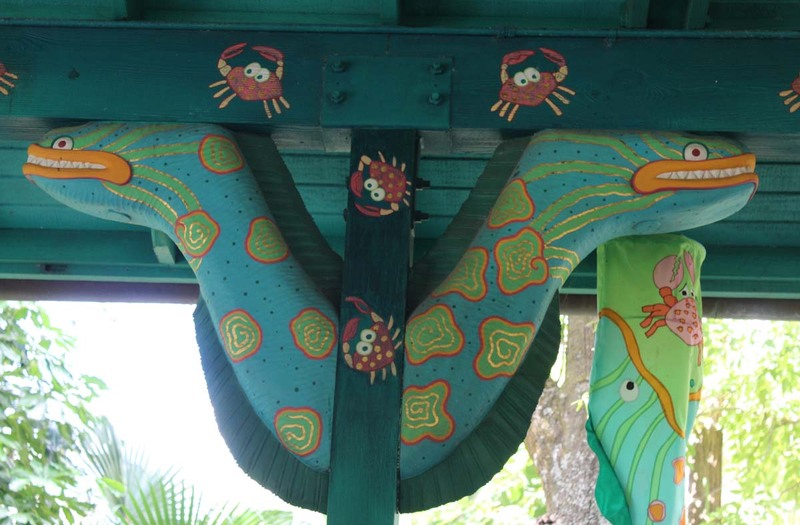 Our first stop was for the Flamingo Badge on Discovery Island where we had to find the flamingo with a leg band. 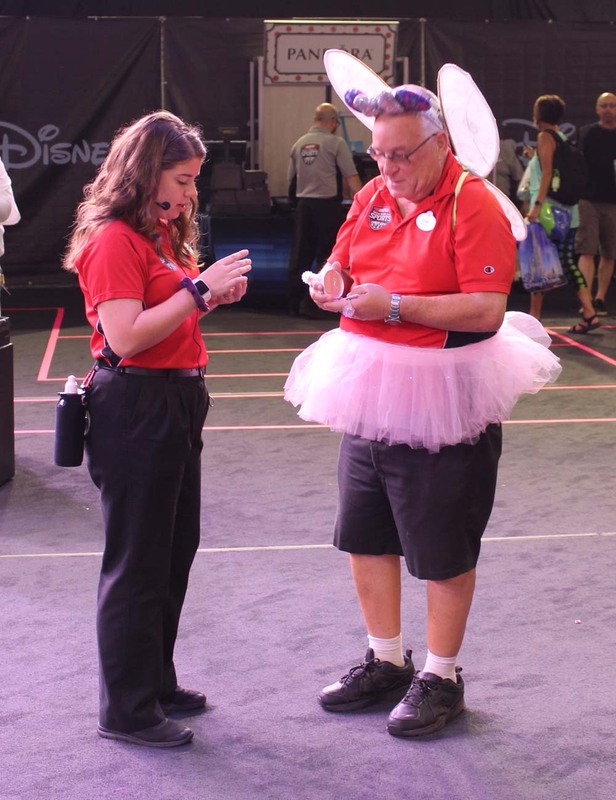 A cast member gives a presentation on them before giving us all sticker/badges. 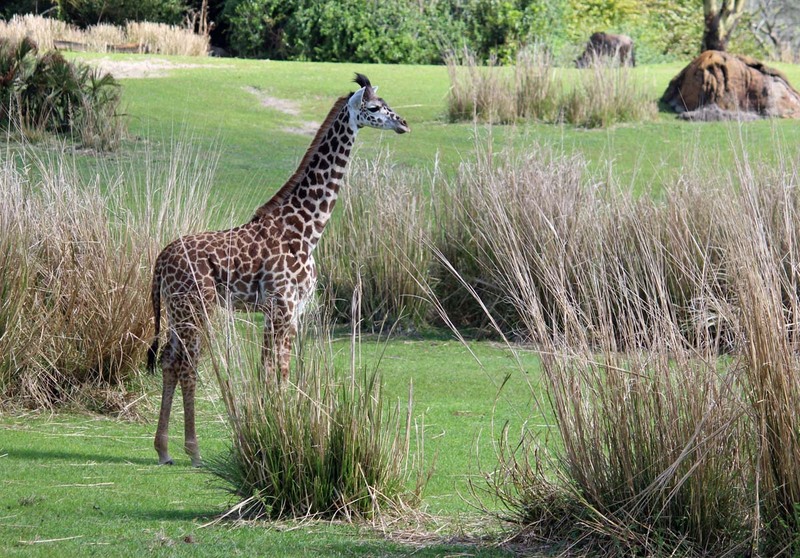 Next, we rode Kilimanjaro Safaris using fast pass. 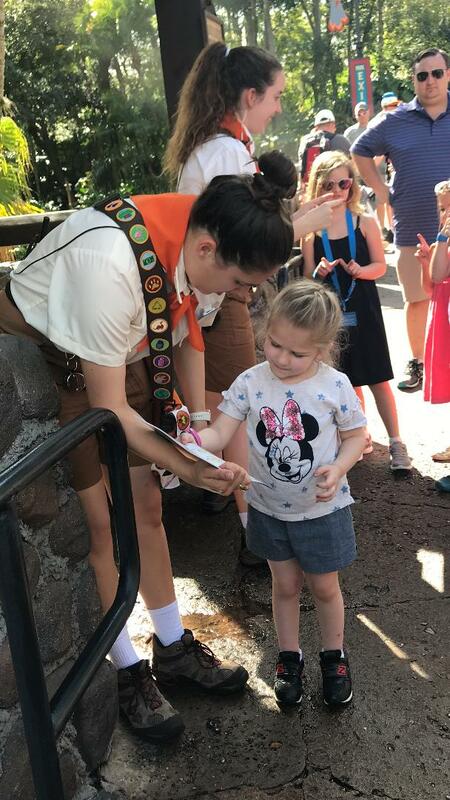 Maddie loved using her Wilderness Explorers book to identify what she saw on our trek. 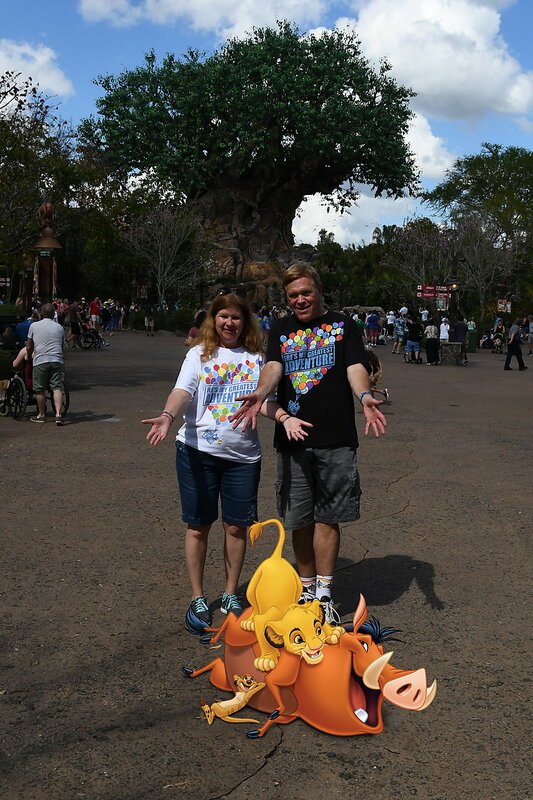 We saw the noon Festival of the Lion King, again using fast pass then we looked for more Wilderness Explorers spots. 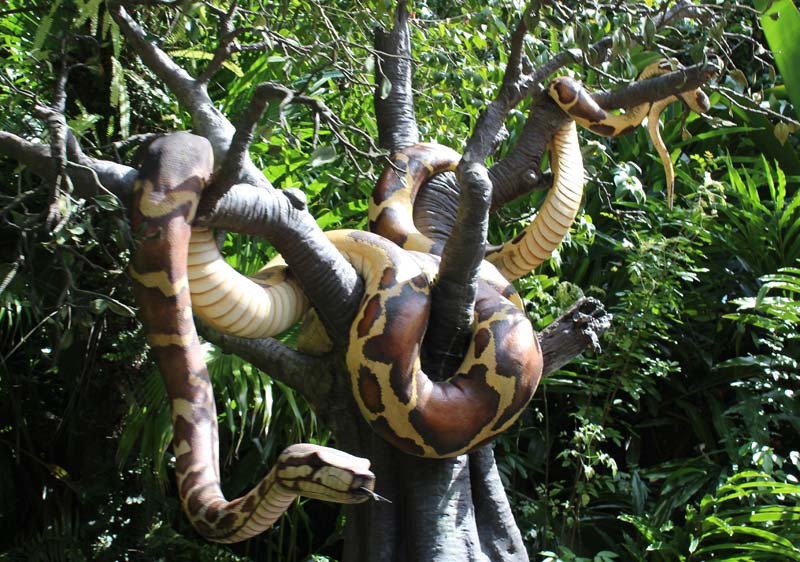 As we were heading to the bug spot, we found Pocahontas on the trail behind the Tree of Life. 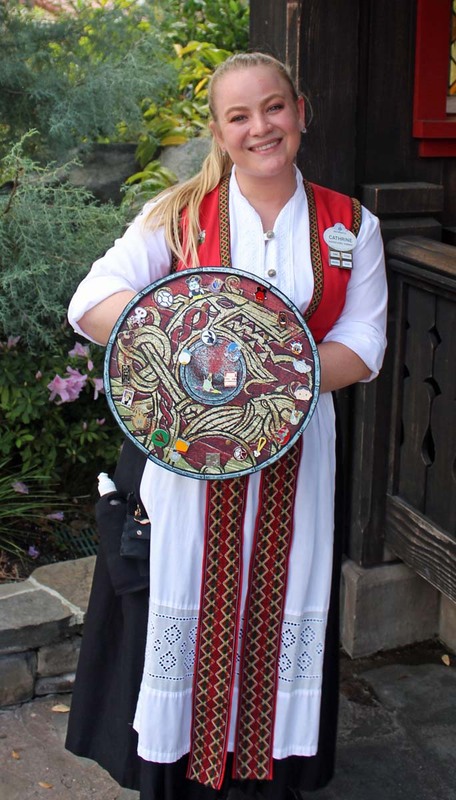 A cast member gave a very interesting bug talk and we got out Insect Badge, then it was time for lunch. 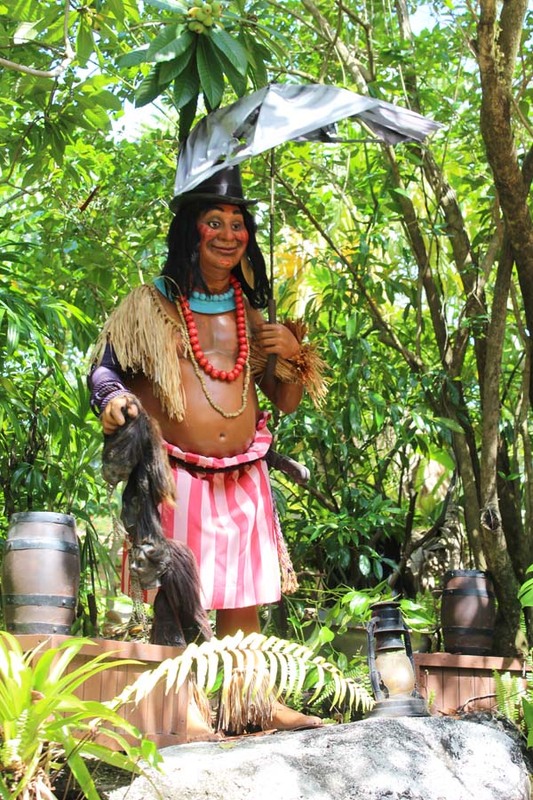 We ate at one of the Flame Tree barbeque pavilions. 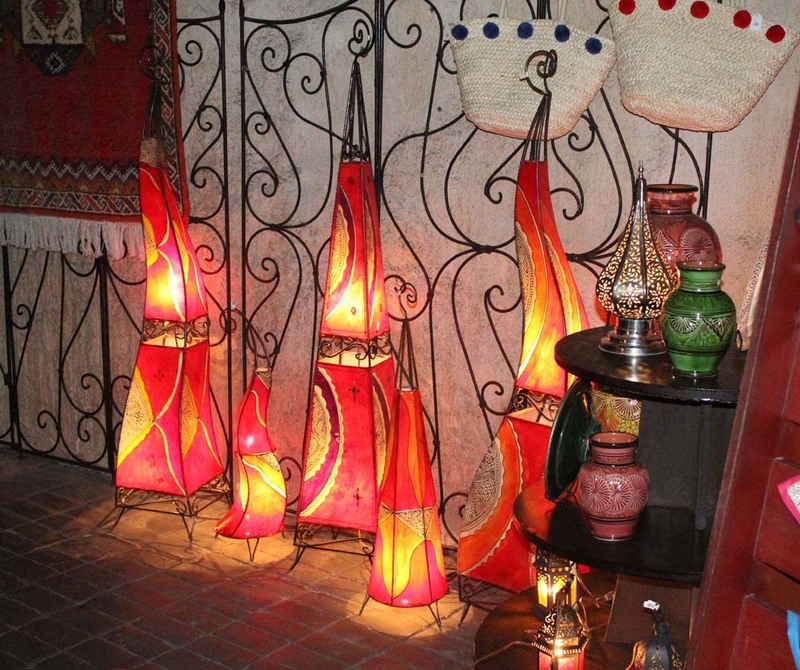 It gave us time to appreciate the decorations around us. The dance party with Simone and Raftiki was in full mode when we headed for a bathroom break. 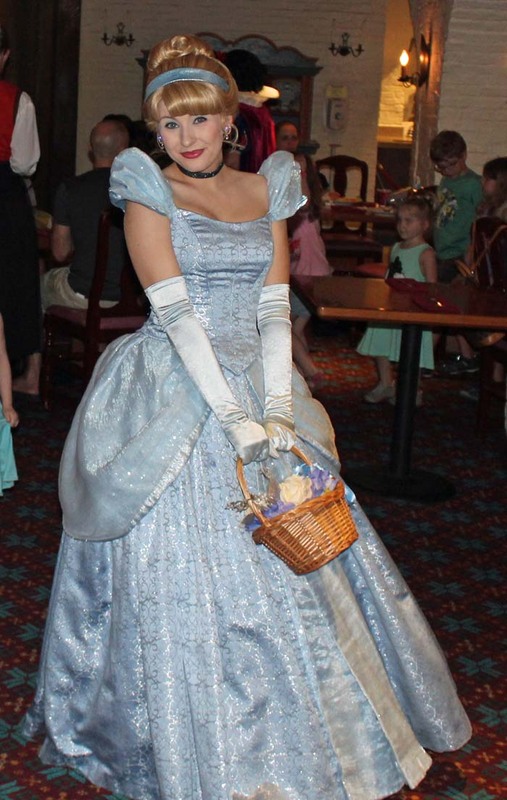 Kelli bought Maddie Cinderella bubble blower at the Discovery Trading Company, which she gave to her a day later. 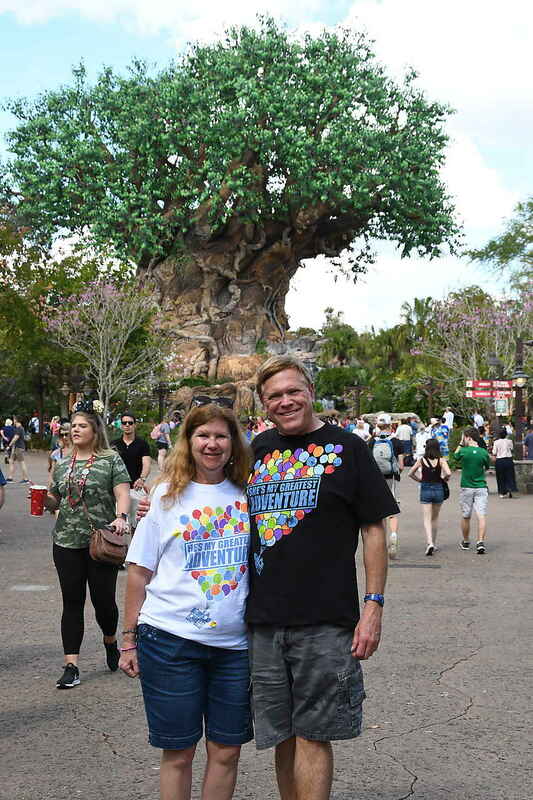 We ended our day at the park with a few more photo pass photographs in front of the Tree of Life. Marissa ordered a Mini Van as we left the park. It was surprisingly hot as we waited for it to arrive. Maddie was all giddy when it showed up. 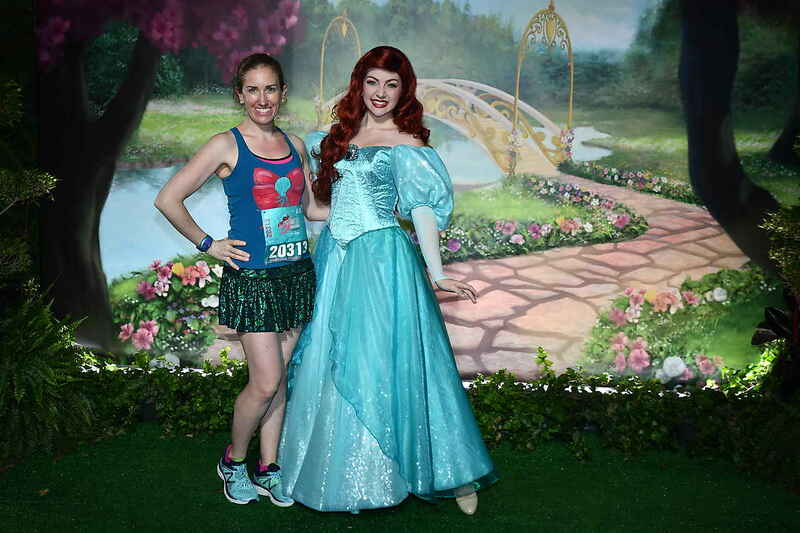 The Mini Van took us over to the ESPN Wide World of Sports Complex to visit the Disney Princess Half Expo. 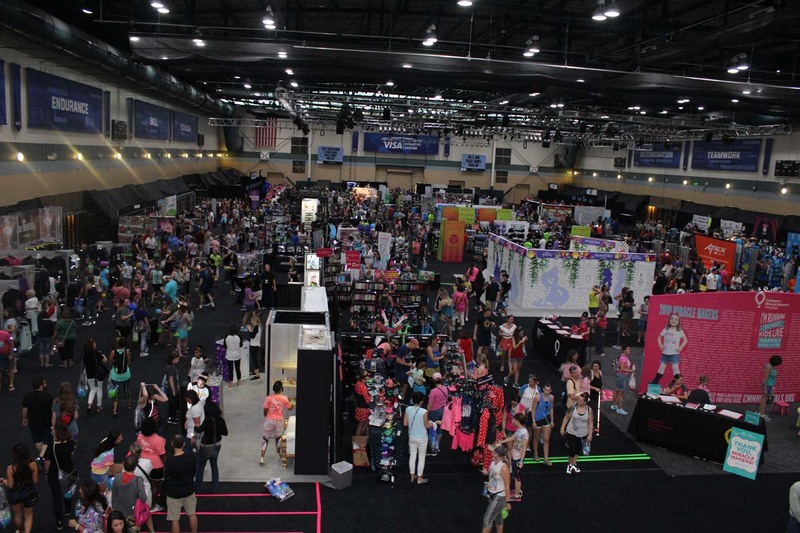 The expo was spread out into three different buildings, one to pick up runner bibs, one with expo booths, and another to get our CHEER squad wristbands and race merchandise for sale. There were many opportunities pictures. Maddie practiced her 100-yard dash as Kelli and I commentated while we waited for Marissa to get her bib. 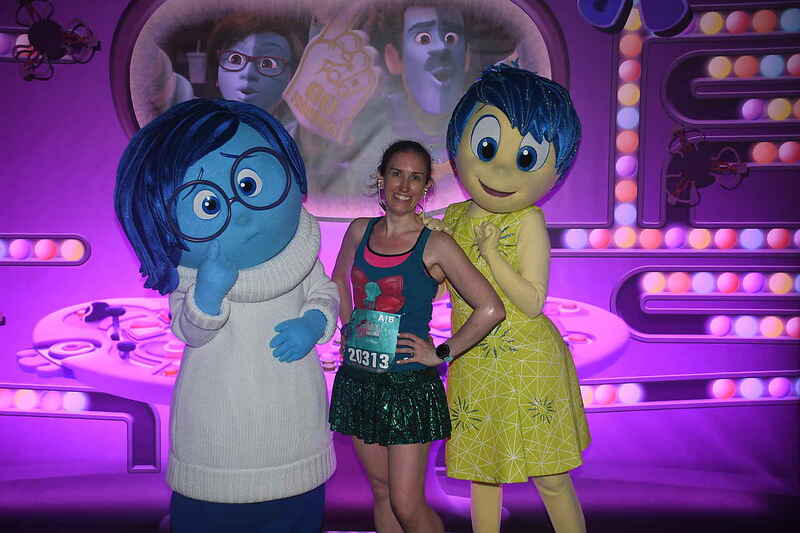 We all loved the cast member in tutu and wings in honor of the princess half marathon. The resort bus took us back to our room. 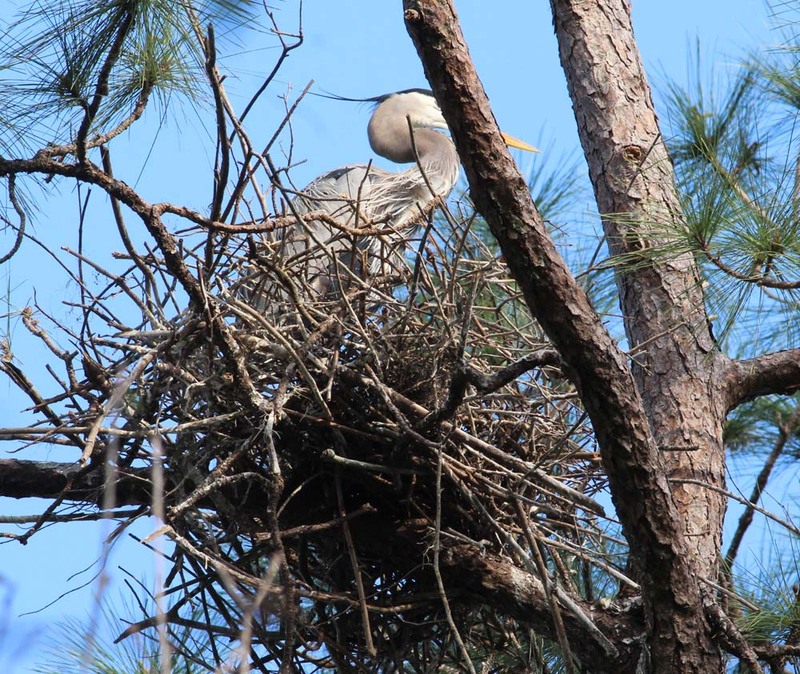 After freshening up, we walked over to Disney Springs but not before checking out three Great Blue Heron Nests that we found on our January trip. One nest had a chick tended by one of the parents. Dinner was at Raglan Road Irish Pub & Restaurant. The Byrne Brothers were performing outside as we checked in. 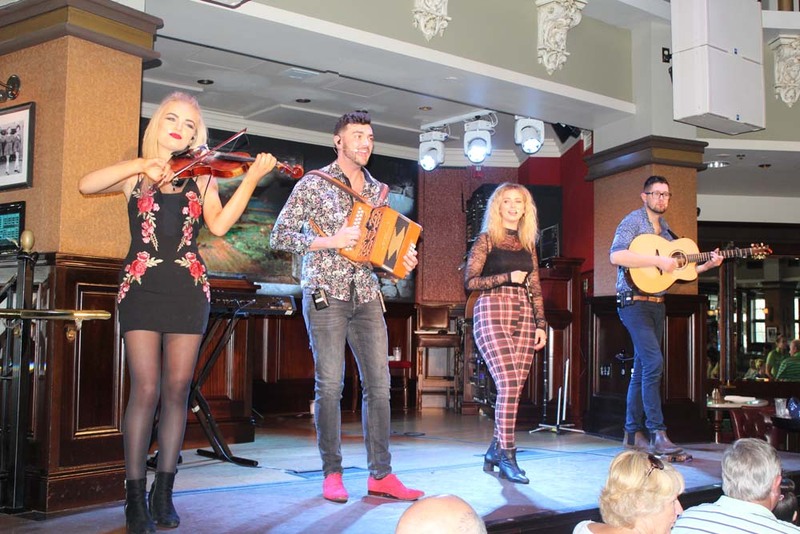 The group are from Donegal and perform traditional Irish music. I brought some Irish whiskey fudge for my co-workers at the small shop. Reel Republic was performing on the main stage as we passed by to be seated in another room. Kelli and I appreciate good bread and theirs was terrific. I tried the Strawberry & cucumber mojito (Captain Morgan rum, strawberry puree, muddled cucumber and mint, lime sour and ginger ale) and Tim started with a Tri Wishes Grand Irish Red Ale. 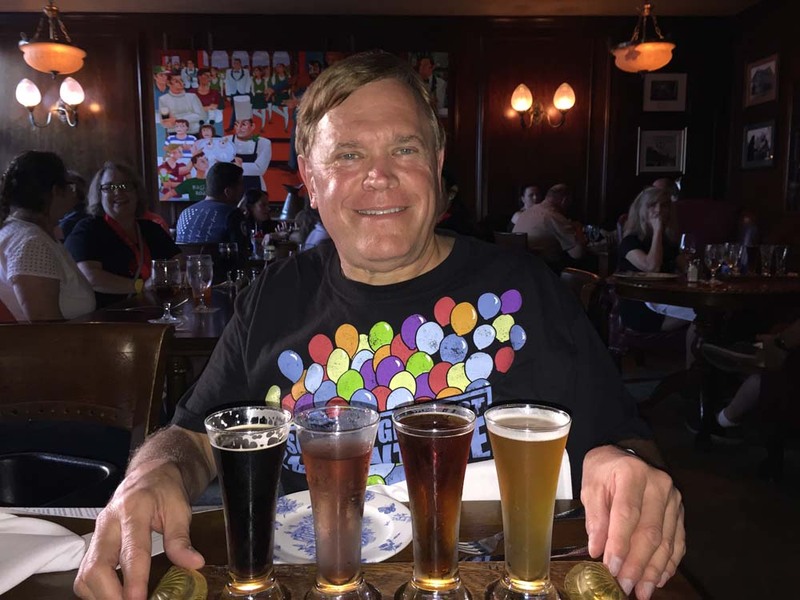 I later got a beer flight consisting of Miriam’s Irish Coffee Stout, Bloomsday Pale Ale, Tri Wishes Grand Irish Red Ale, and a Painted Strawberry & Lime Hard Cider. Kelli liked the cider. I liked all of them. Ben Gunnery, a fiddler and two Irish dancers came by to entertain us. We shared the sausage roll and onion rings appetizers. Entrees included; It's Not Bleedin' Chowder! ; Boaring Burger (grilled wild boar with blue cheese, crispy onion strings, arugula, port and pear chutney); the Keen Eye for the Shepherd's Pie; and Raglan Risotto with chicken (butternut squash risotto, shiitake mushrooms, parmesan, peas and macro greens with parmesan crisps). We also had a side order of Smokey Bacon and Almond-roasted Brussels Sprouts. Maddie and Liam had the Kids fried chicken and the Kid mac and cheese. Once again, Ragland Road did not disappoint. This is our sixth time here and we will be back again. After dinner, we shopped the springs. Kelli brought a Kipling backpack with Mickeys on it. Kelli and Marissa shopped Vera Bradley but came out empty handed. Tim and I gave each other high fives for that! 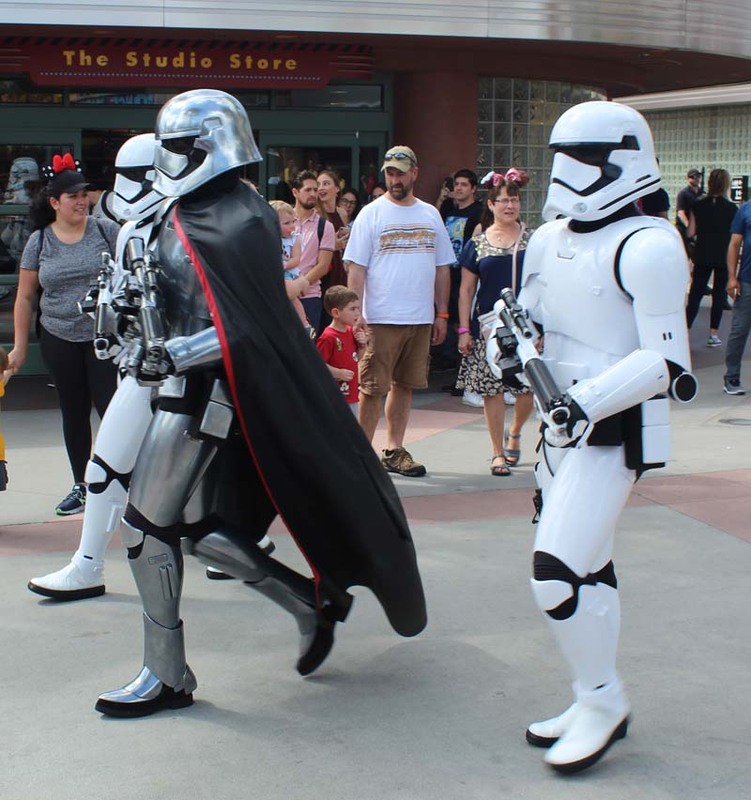 We all headed back after shopping the World of Disney. Kelli and I made a detour around our building and found roosting Snowy and Great Egrets in the trees over a path next to the buildings. 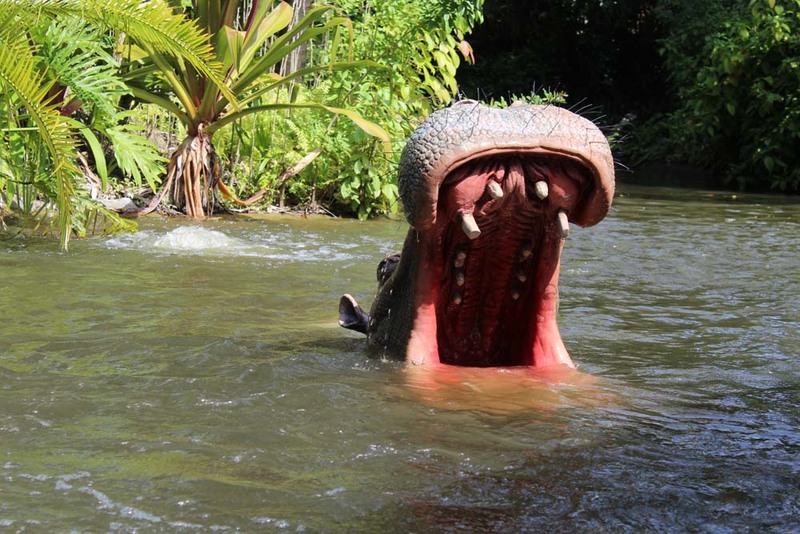 All of a sudden, I heard a big SPLAAAAT behind me. One of the egrets tried to defecate on me and missed me by inches. Kelli had a good laugh. 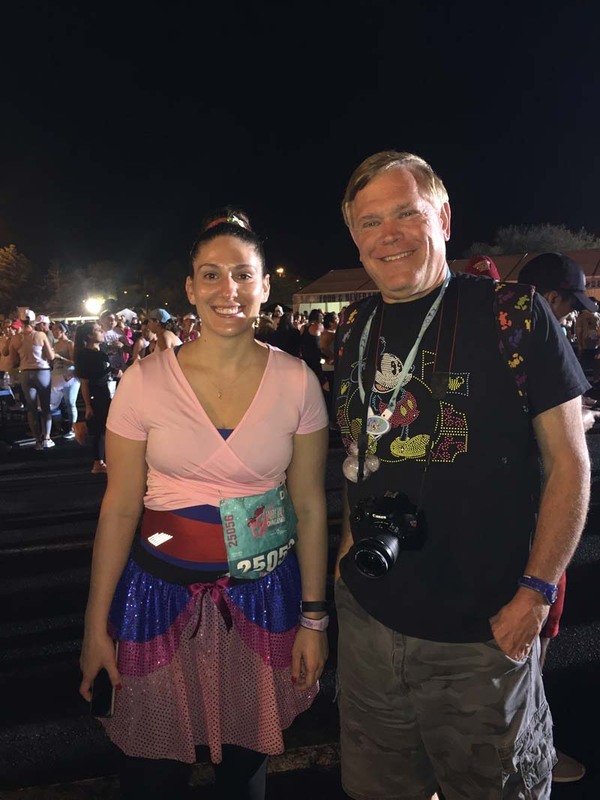 Tim and Marissa were up early for her 5 am Enchanted 10K. We slept in a bit but were up before the kids. After they returned, Kelli and I did a short bird walk after breakfast. 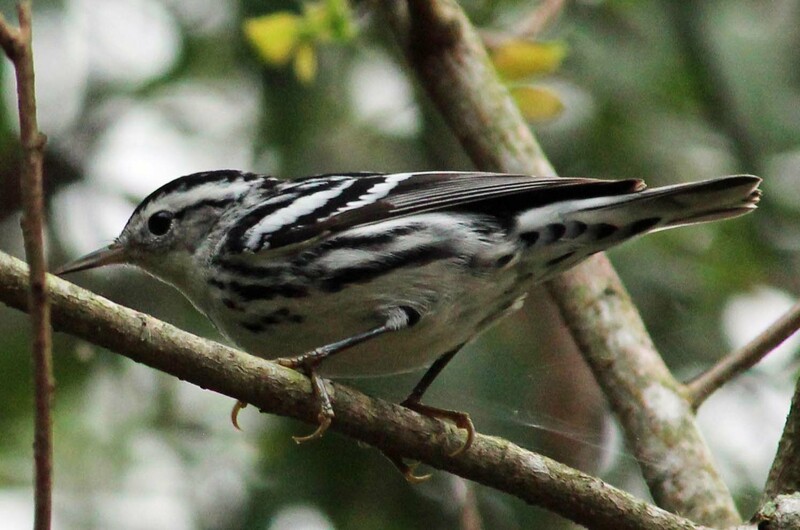 Highlights included a White-winged Dove, Limpkin, Wood Stork, White-eyed Vireo, Black-and-White Warbler and a Yellow-throated Warbler. We spread out along the course with Marissa taking Maddie to the start line, Tim and Liam were at the finish line and Kelli and me along the course to take video and photos. 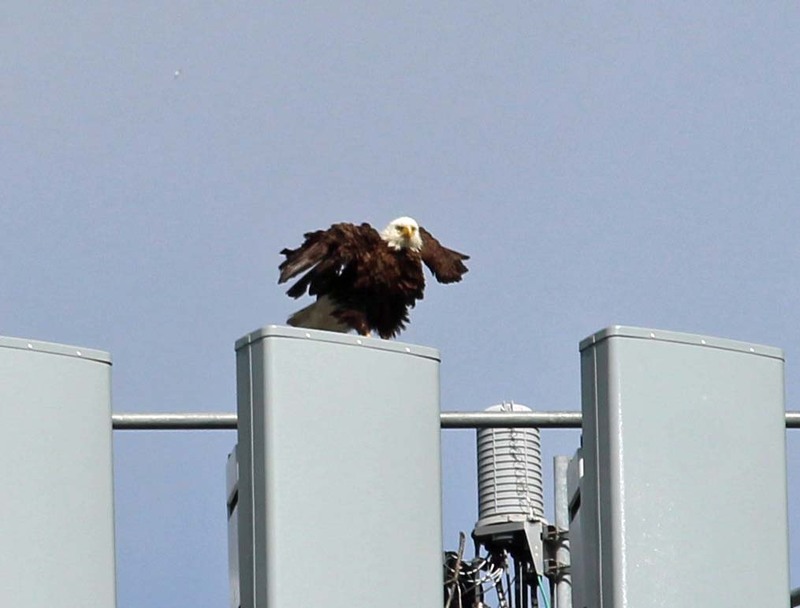 I looked up and saw a Bald Eagle land on a light tower. I texted everyone so they could see it. I pointed it out to a nice British couple behind me and they thanked me for letting them know. 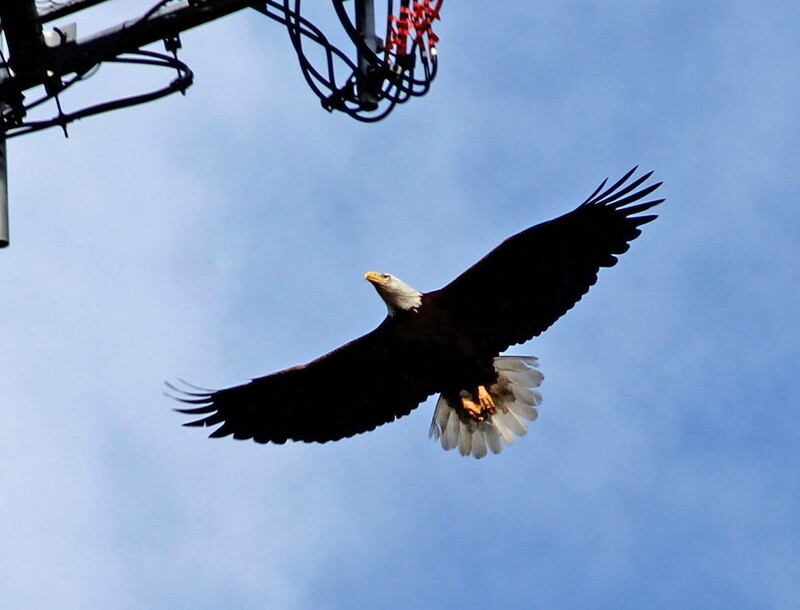 It then flew to the next light tower nearer me and I snapped some good photos. Maddie was in the first heat and did well. 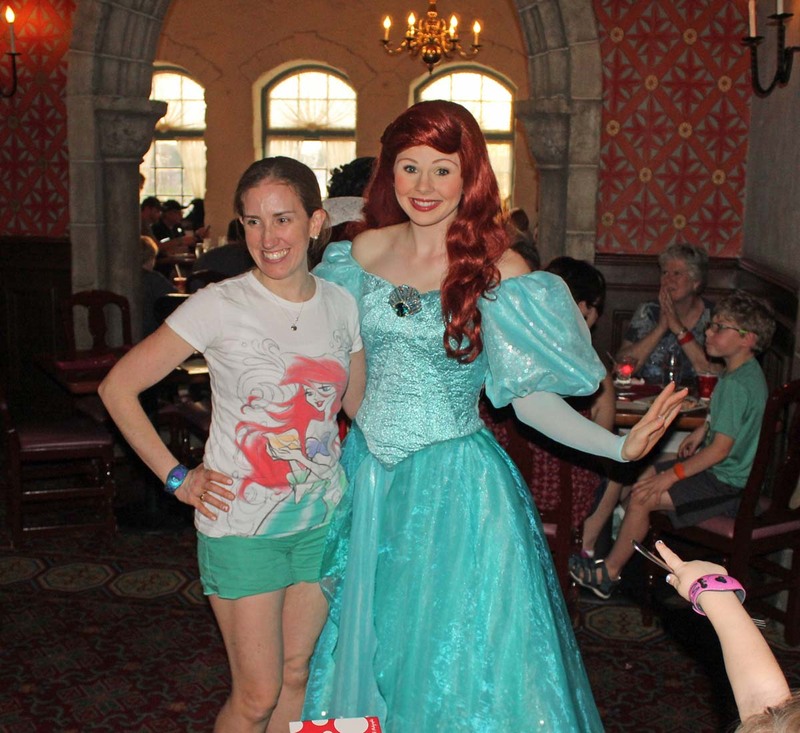 She received a medal featuring Sophia the First, one of her favorite characters. 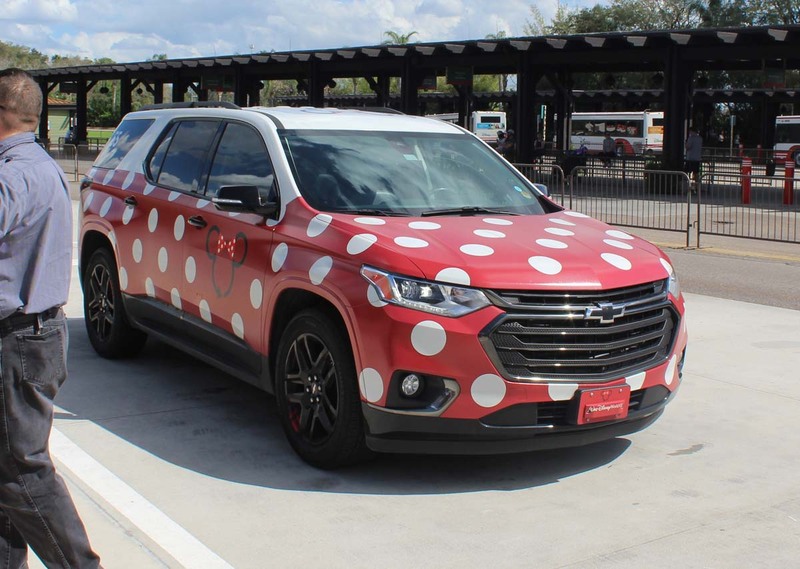 We used a Minnie Van again to get to Disney's Hollywood Studios. First stop was Starbucks in the Trolley Car Café for a coffee and a snack. I grabbed a rice crispy treat from Beverly Sunset Boutique and we all sat for lunch behind Sunset Ranch Pins and Souvenirs. Kelli and I purchased some Clementines and an orange from Anaheim Produce, so juicy and delicious! We all shopped for pins in Sunset Ranch where I got an exclusive Visa Steamboat Mickey pin. 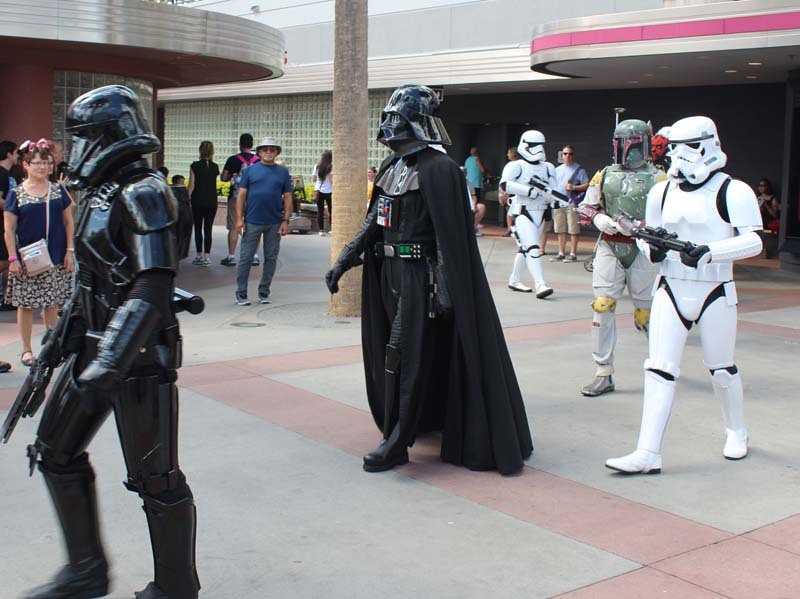 In Animation Courtyard, we saw storm troopers, Darth Maul, Vader, Kilo Ren followed later by Rey and Chewbacca on their way to perform Star Wars: A Galaxy Far, Far Away. 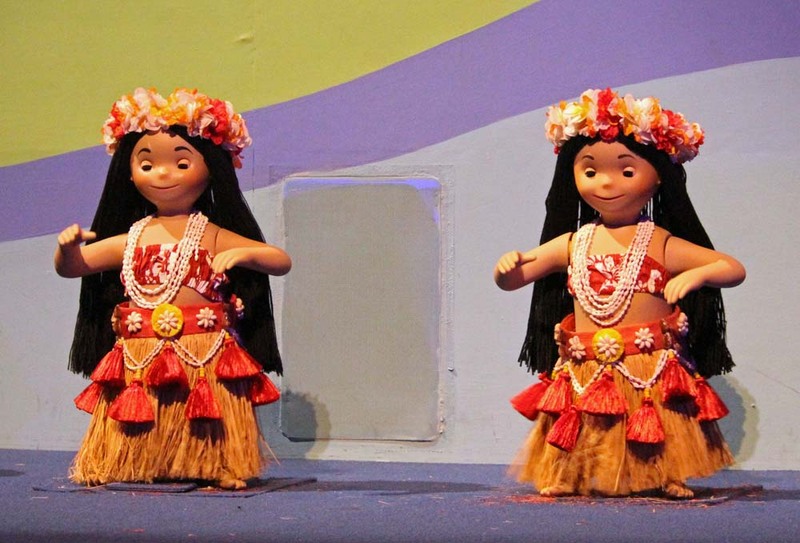 Next was a new attraction for Kelli and me; the Disney Junior Dance Party! I sat on the side near the stage and watch the others as they sat on the floor in front of the stage. It turned out to be a great vantage point watching Maddie dance up a storm during the show. 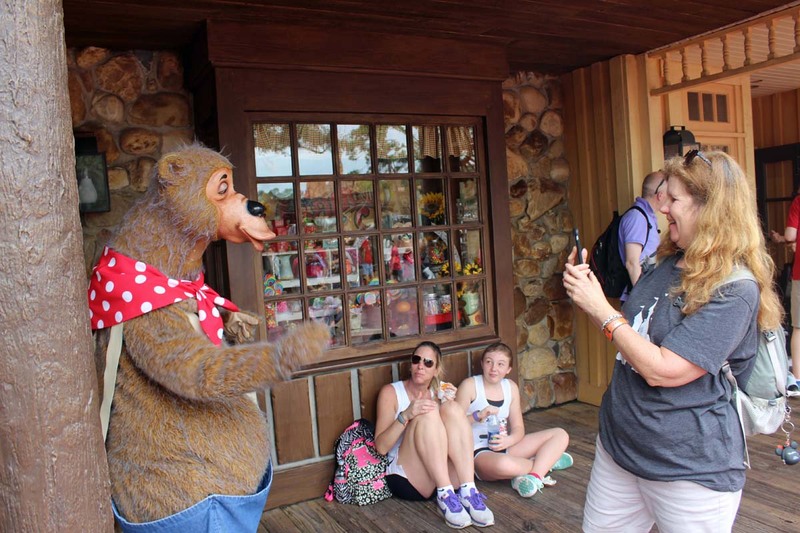 By the look on her face, this must be one of her favorite things to do in Disney. After the show Madiline met with Sophia the First, Doc McStuffins and for the first time, Vampirina. Maddie wore her Sophia the First 100 yard dash medal and Sophia noticed it. 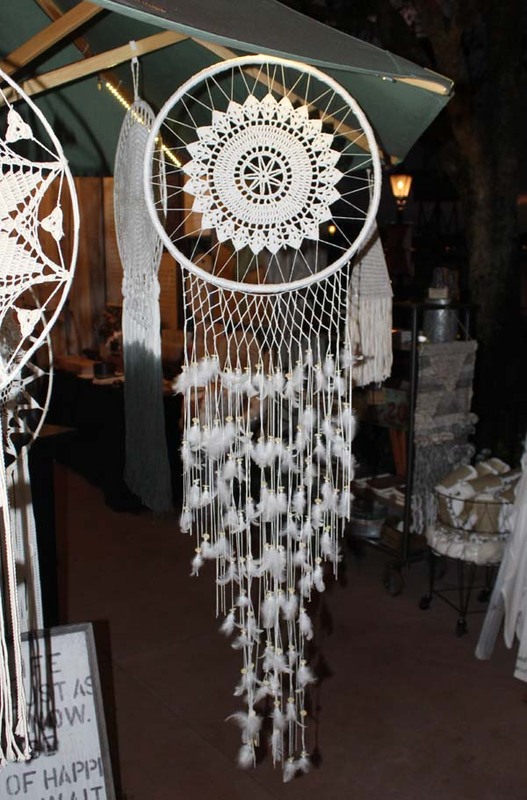 During this time I snuck away to find and purchase something I saw earlier in the trip. 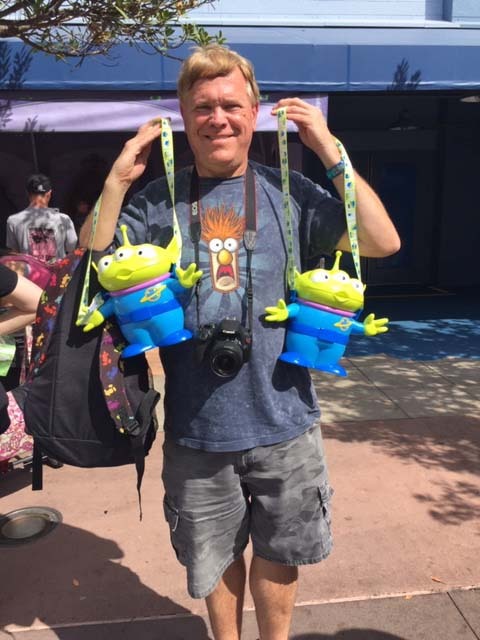 A Little Green Alien popcorn bucket. Actually, I got two, one for Tim and Marissa. 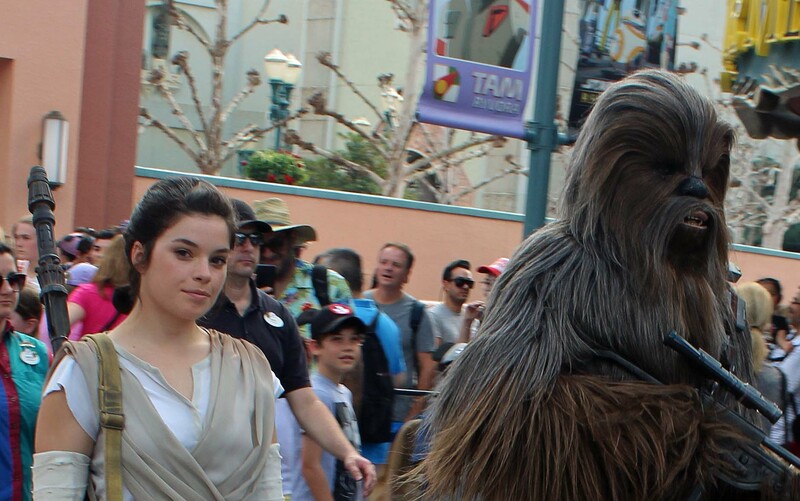 We also saw the Star Wars characters return from their show. 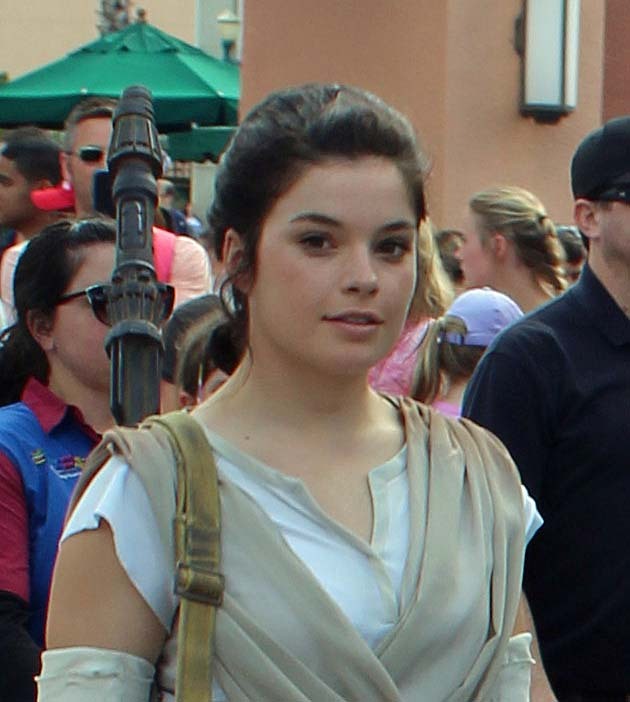 Rey looked right into my camera for a great shot. Kelli brought some cute Mickey ears hat for Liam inside the Disney Studio Store. 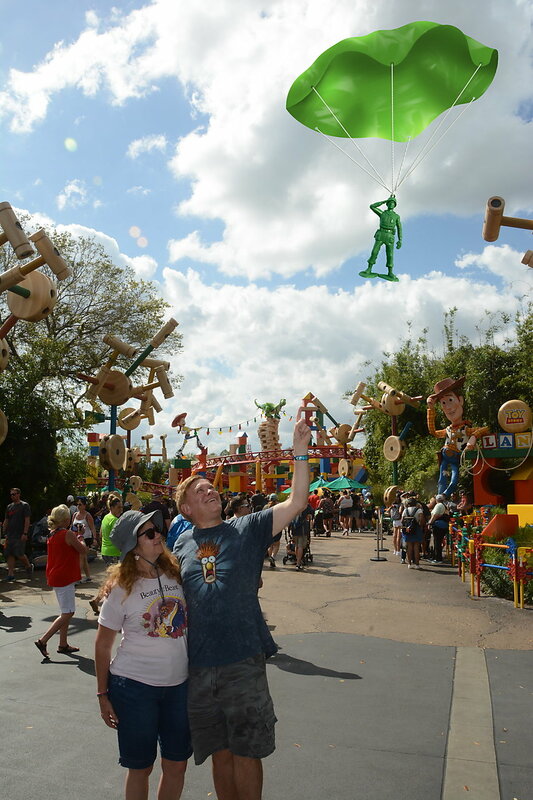 We headed to Toy Story Land and had a neat magic shot from a photo pass photographer featuring a green army man parachutist. Tim, Marissa and I went on Slinky Dog Dash as Kelli watched the kids. As we made our way through the fast pass queue, the green army men drummers came by. This was another new ride for me as lines were huge when we were here in December. Inside Toy Story Land, you can see some of the new Star Wars area buildings in the background. On our way out, we saw an ECV train. 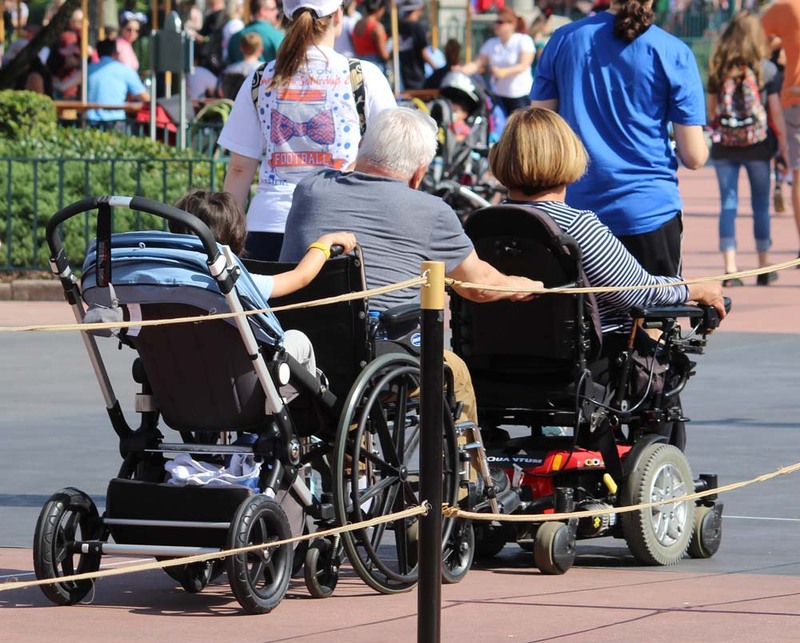 A woman in an electric convenience vehicle was pulling her husband in a wheelchair followed by a boy with a stroller. 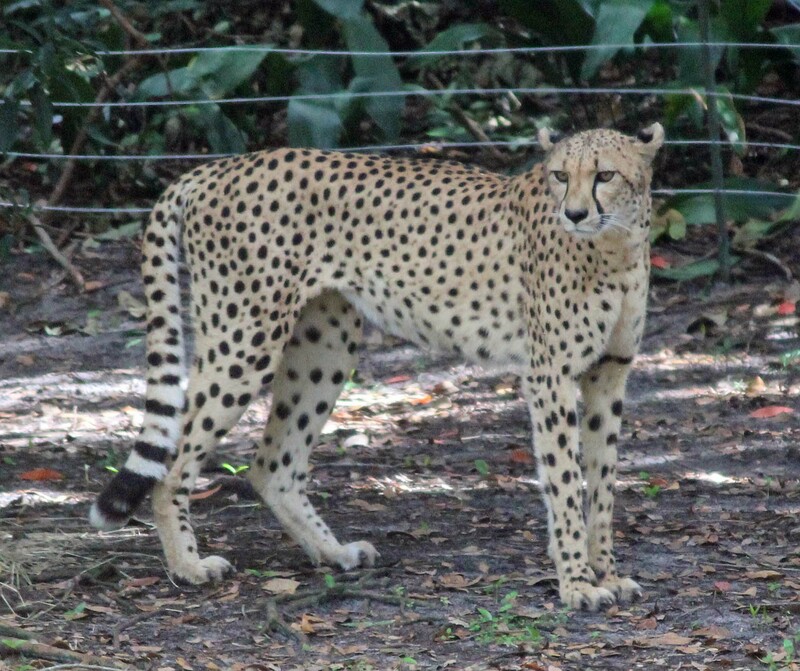 Each was hanging onto the next transport in front of them as they made their way speedily through the park! 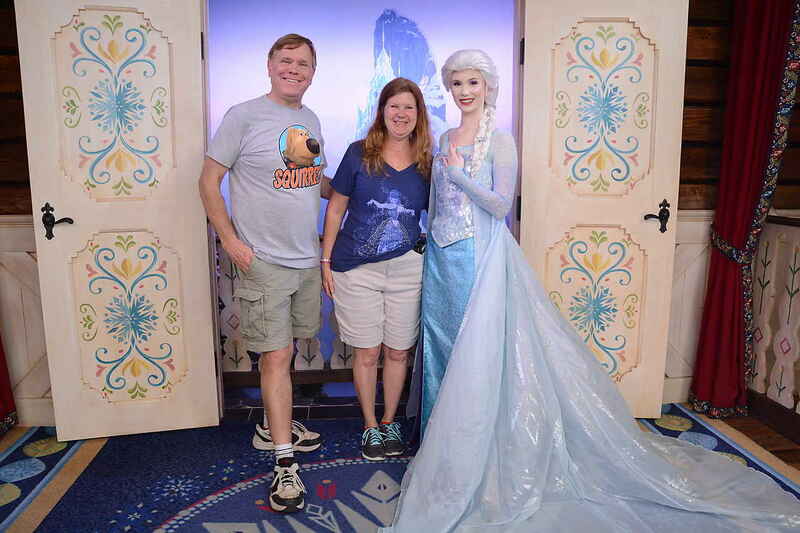 We were tired so skipped our fast pass for the First Time in Forever: A Frozen Sing-Along Celebration and headed out. Thankfully, our resort bus is the first one you come to since the temporary bus station is quite a ways from the exit. On the way back w could see that the gondolas are nearly complete. 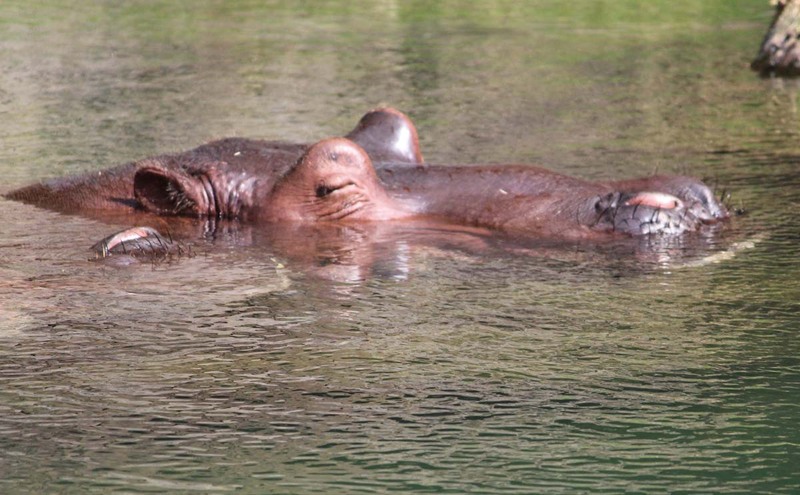 We had cancelled our ADR for Enzo's Hideaway the day before so we were able to hit the Springs pool for the afternoon. Maddie went down the kids side numerous times . I did the big slide a few times and I played a game with a cast member and others in then pool. The group tried to keep a beach ball up in the air. We ate back at the villa after picking up some dinner at the Artist Pallet along with some left-overs from the night before. Kelli and I had the sausage and mushroom pie, turkey brie sandwich and a delicious chocolate strawberry cupcake. Later we walked to Disney Springs with the hope of having dessert at Giradellis, but it was too crowded. Tim, Marissa and the kids headed back early and Kelli and I shopped the World of Disney where I got Maddie the Mickey and Minnie change purses she’s been admiring on Kelli’s backpack. I tried some Dulce de Leche Churro balls from the Four Rivers Cantina truck and we watched dancers on the stage nearby. On our way back to the resort, we saw our first rabbit of the trip in the dark in the lawn. Today will be a long day. We woke at 2:30am. All of us walked to the Carriage House area and got on the first bus that left the resort at 3 am. It was a long walk through security to the holding area. I texted my friend from work and Rachel meet us a while later. I was happy to get some pictures together. At 4:30 Marissa headed to her corral and we headed to the Epcot monorail. At the Ticket and Transportation Center, we had to walk down the ramps to transfer to the Magic Kingdom monorail but they set it up so we did not have to go through security again. We had a short wait until they opened up the gates into the park. 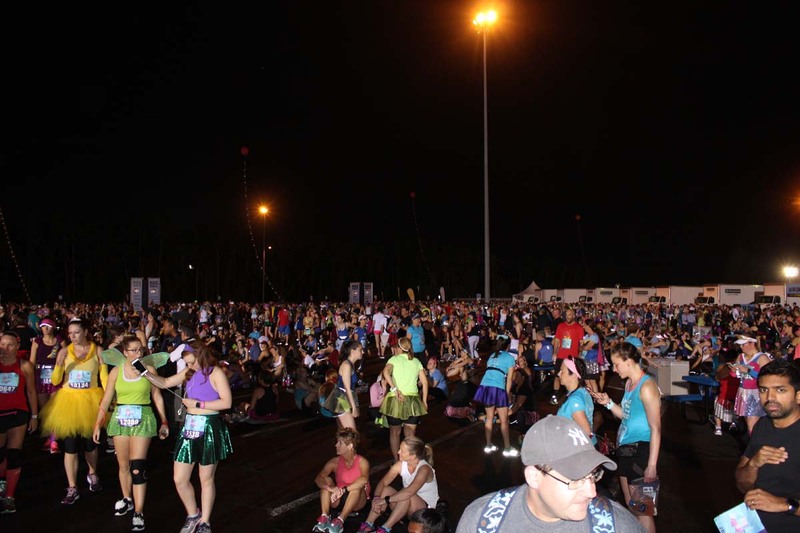 The Disney Princess Half Marathon starts at 5:00am. 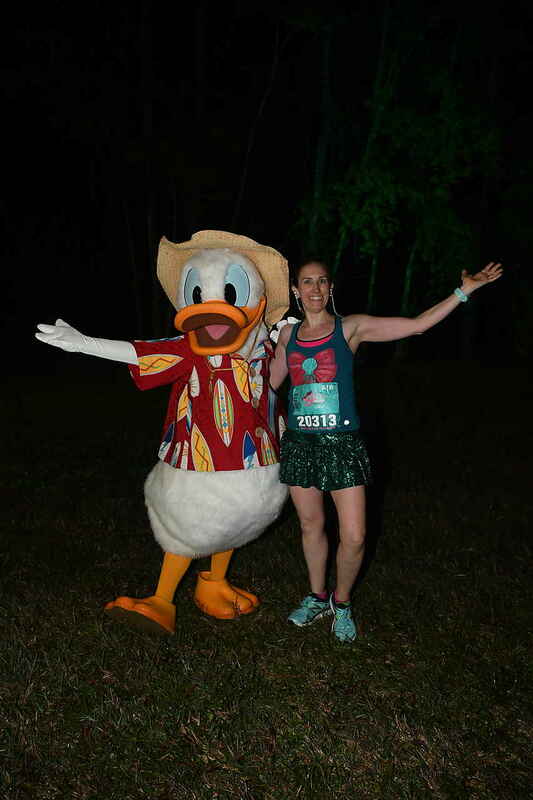 By 5:30 am, we were waiting for runners across form Tony’s Town Square. 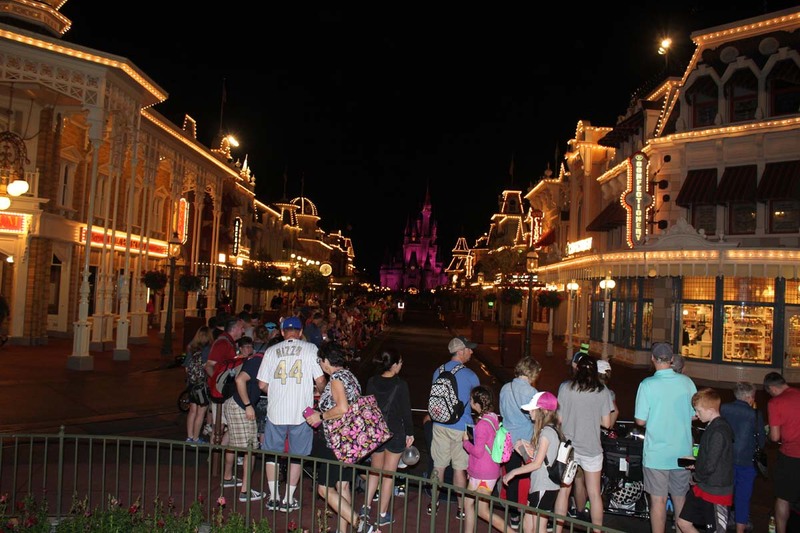 It was magical to be on Main Street, all lit up with background music playing in the middle of the night. Spectators lined Main Street ready to cheer the runners on. 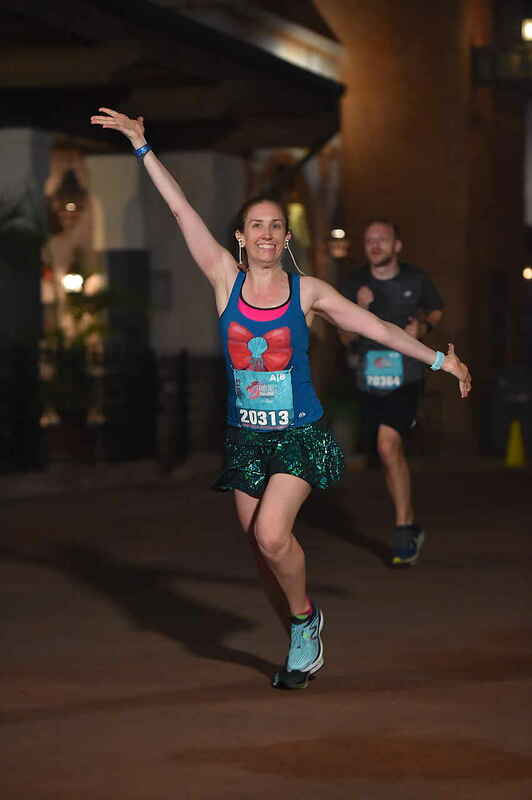 This year runners entered the Magic Kingdom under the train station. While waiting, Maddie made Mickey ears with some light up rings. The first handicap cyclist past us at 5:54 am; the front-runner at 6:03 am. 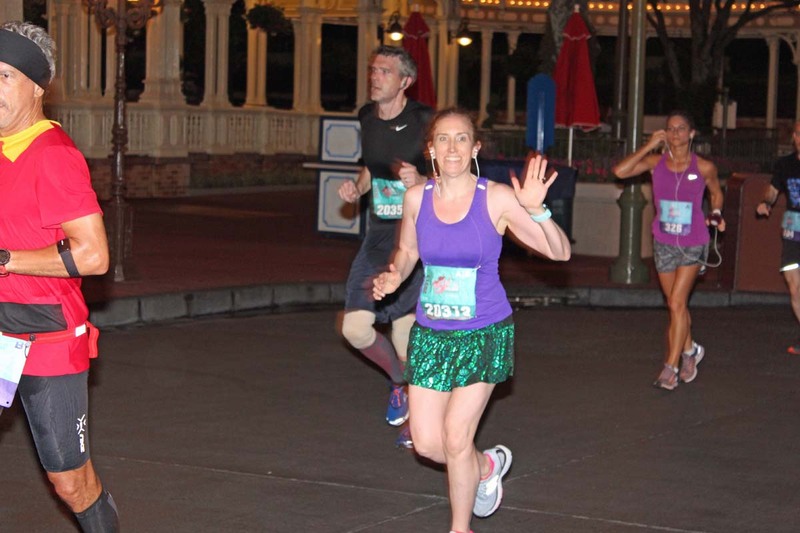 We were able to follow Marissa on the Run Disney App and she passed by us at 6:21am. 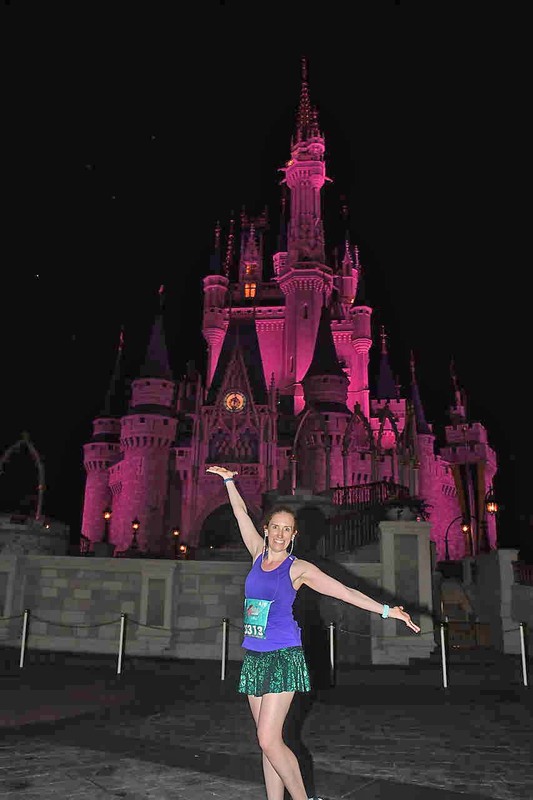 We hurriedly walked up to the castle and entered the private CHEER section and saw her come down from the castle, pose for a picture then pass by us at 6:27. We headed back to the finish line via monorail. 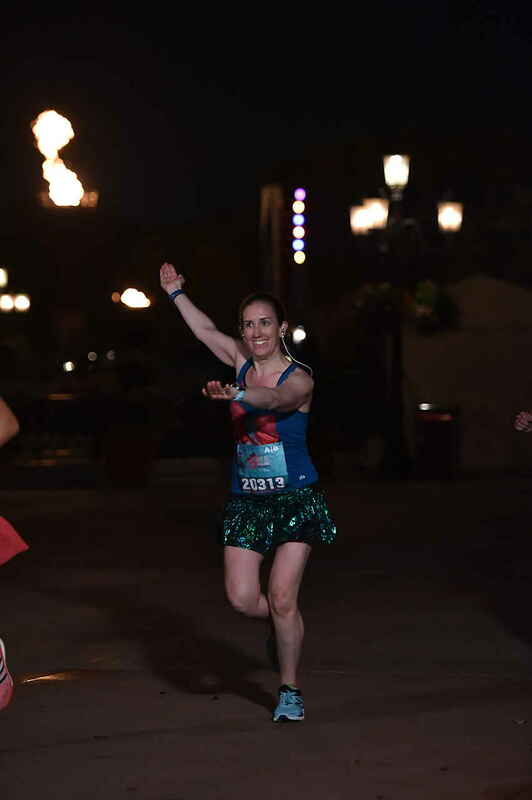 My friend Rachel was now on the course running up World Drive to the Magic Kingdom. 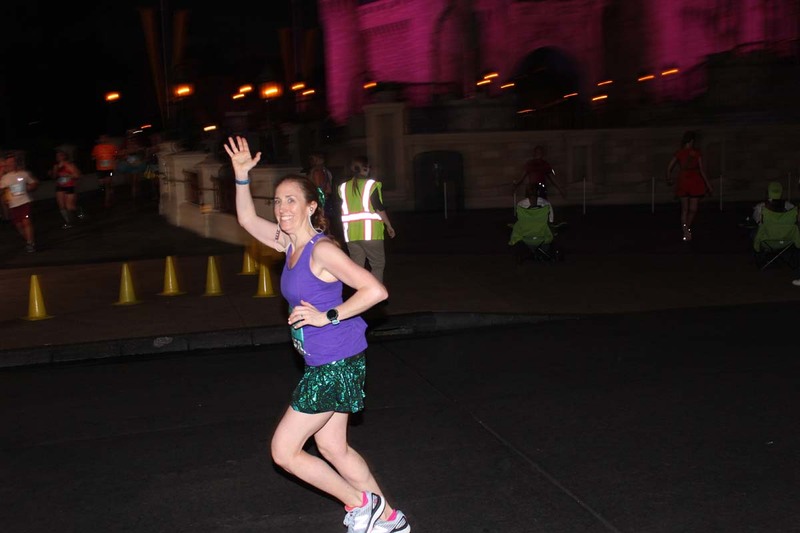 We could see the early runners as we passed by the Grand Floridian and much to our surprise saw Marissa between that resort and the Polynesian. 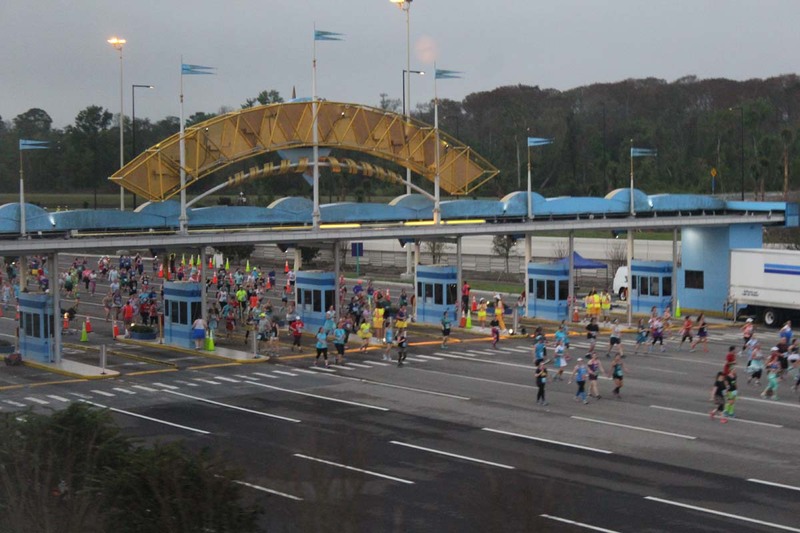 On the Epcot monorail, we could see the runners on World Drive heading to the castle. 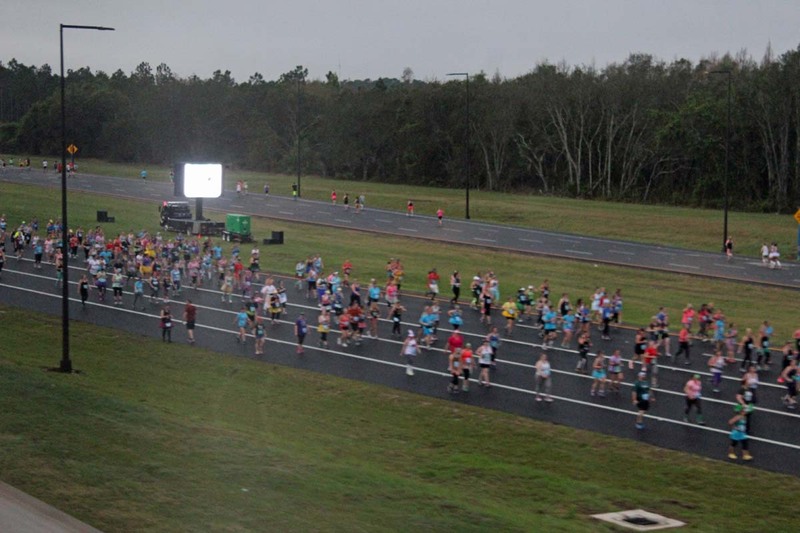 Then even more runners on Epcot Center Drive. 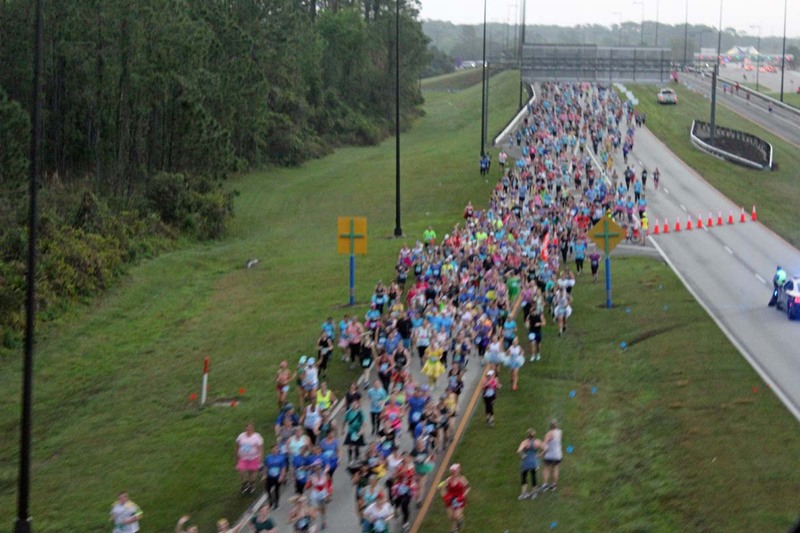 These runners had just started their race. 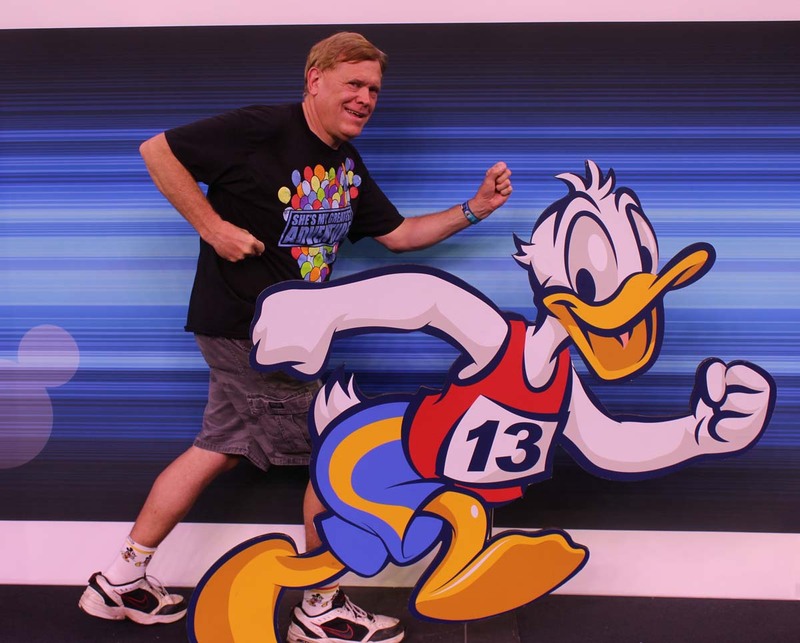 When we rounded Spaceship Earth, we could see the front-runners running through Epcot. We were at the finish line at 7:11. The CHEER section here had coffee, hot chocolate, water, soda and snacks for us. 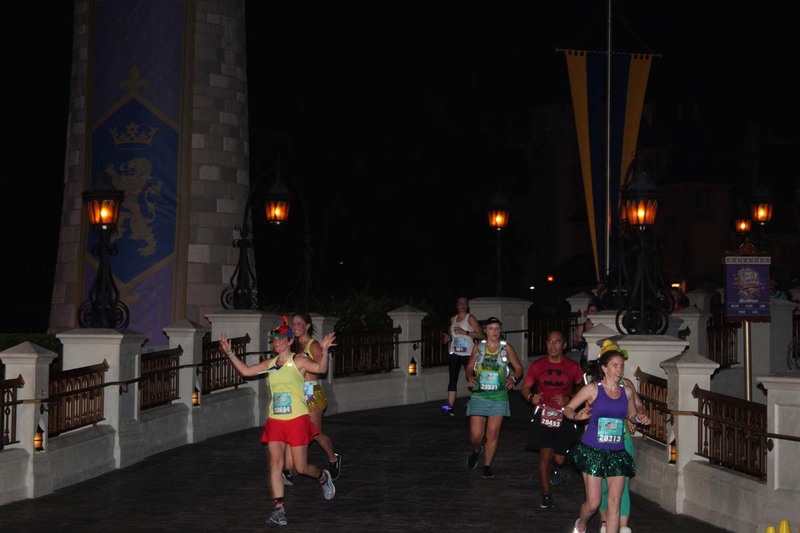 Mickey, Minnie, Goofy, and Donald Duck were greeting runners near the finish line. 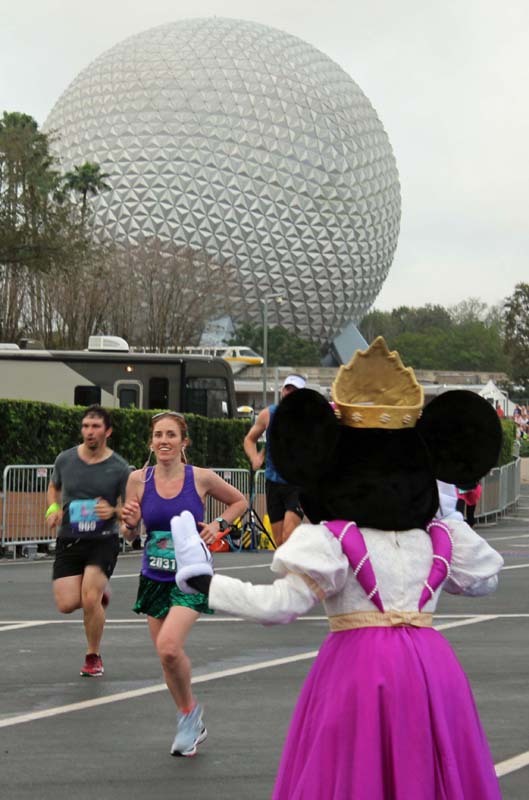 We could watch the runner approach with Spaceship earth in the background. 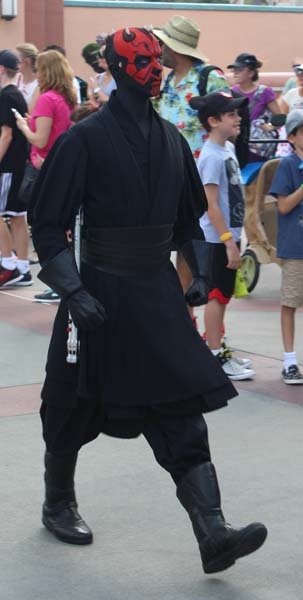 It was interesting to see some of the costumes people were wearing. 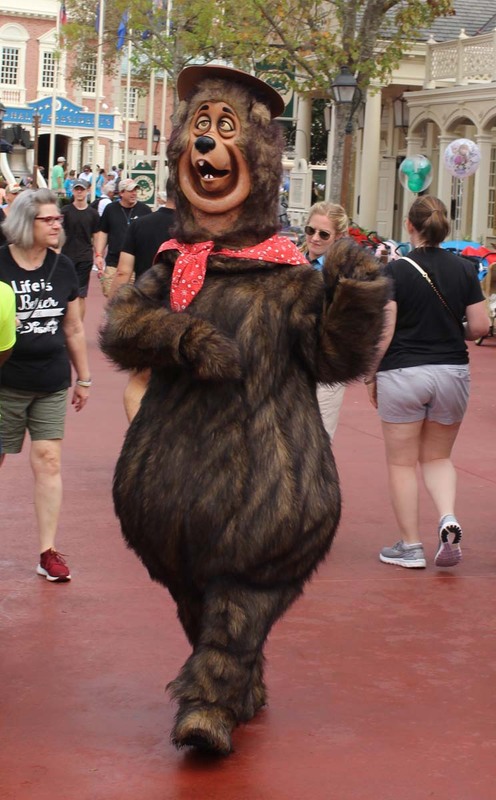 Most notably a bride and groom, and someone dressed at Gaston. Marissa crossed at 7:26 am. Congratulations Marissa! We waited a while for Marissa to come out of the runner’s tent. She had two big bags of ice on her knees. I then saw the two runners from earlier. 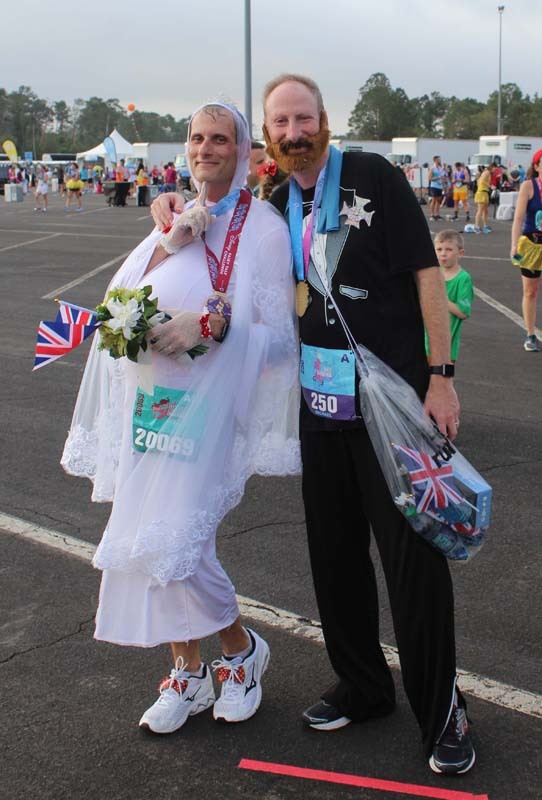 Both men, the “bride” was a pregnant bride with the groom. We headed back by bus to check out of our villa. 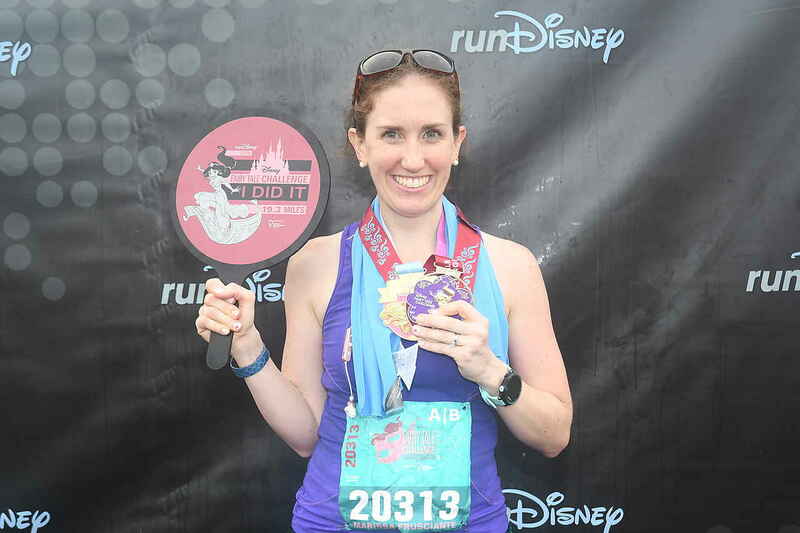 I followed Rachel on the Run Disney App and she successfully completed the half-marathon. Congratulations Rachel! Maddie and Marissa posed in the winners circle back at the resort. We had to finish packing and check out by 11 am. We called for bell services but there was a 1-hour wait. We lucked out as one of them was dropping off a family a couple of doors down and we were able to pile our luggage on his cart and get a ride to the Carriage House. We stored our carry-ons with bell services. Tim, Marissa and kids had to go to Epcot to drop off her medals for framing. 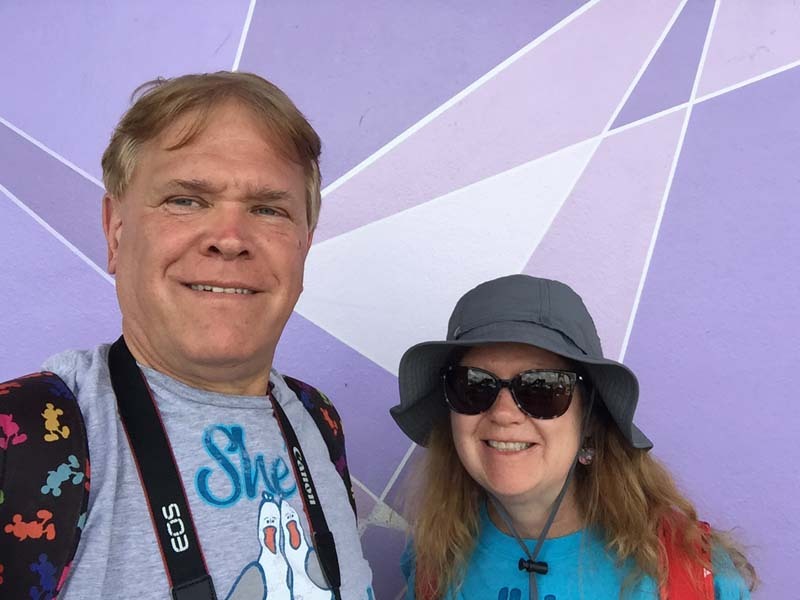 Kelli and I headed to the Magic Kingdom where we will meet up later. Kelli and I first went shopping in Big Top Souvenirs. Then enjoyed the Main Street Philharmonic band in Storybook Circus. 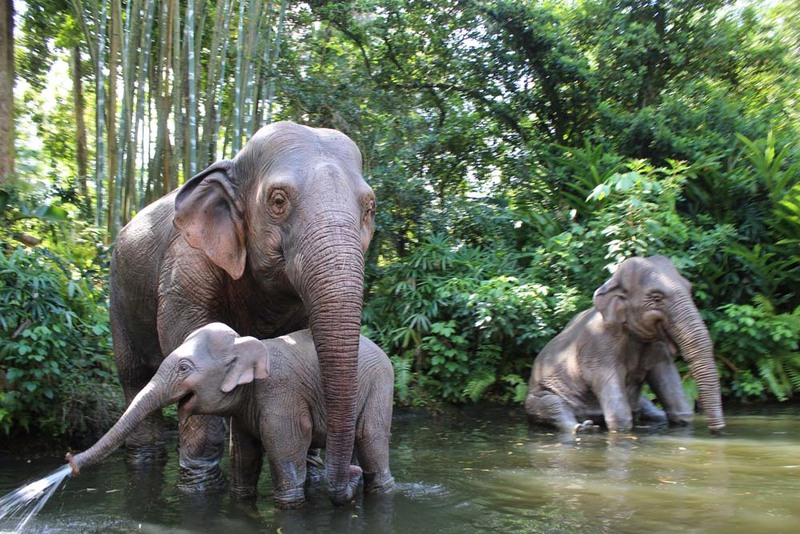 We crossed the park to use our fast passes for the Jungle Cruise, followed by a ride on the people mover. 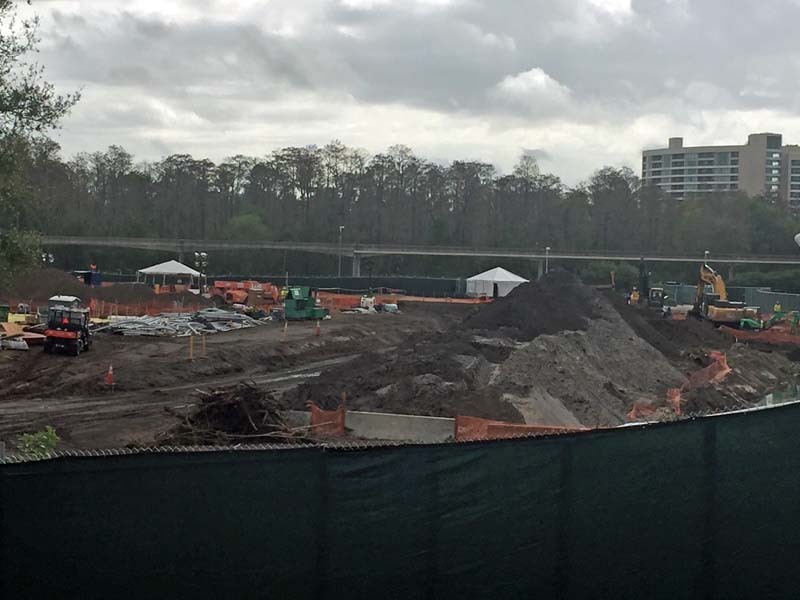 We could see most of the construction site for the new Tron attraction. They had not started to erect anything. 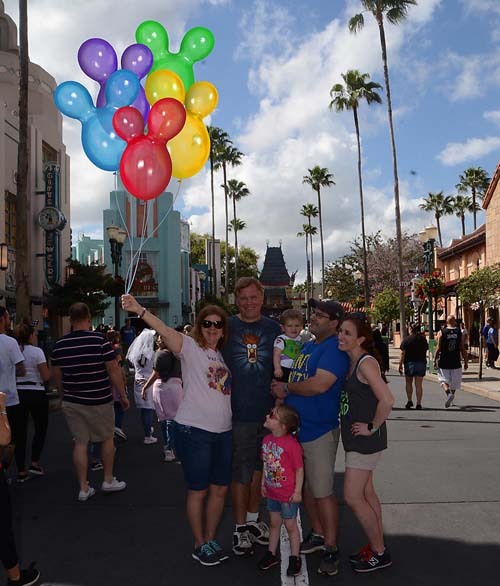 Marissa, Tim and the kids had entered the park and we met them at the Tomorrowland Terrace for a packed lunch. 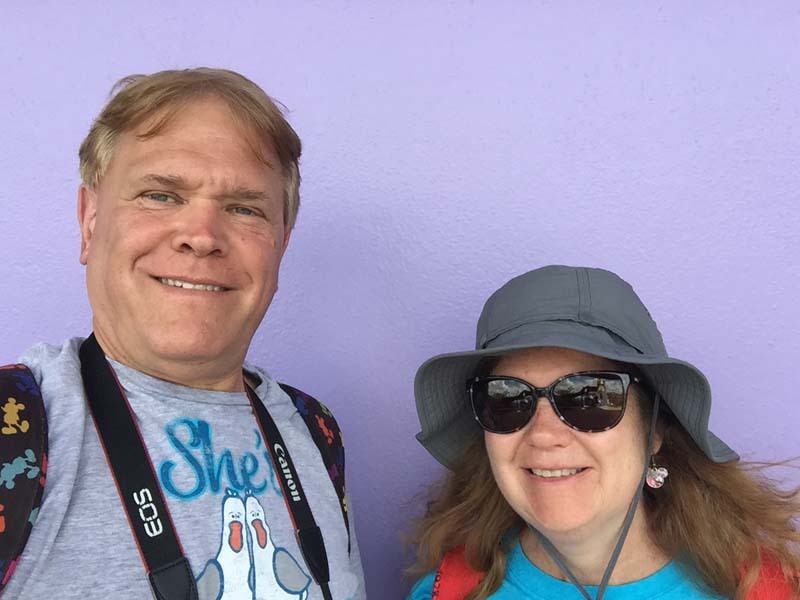 We then took some selfies in front of the purple wall nearby. 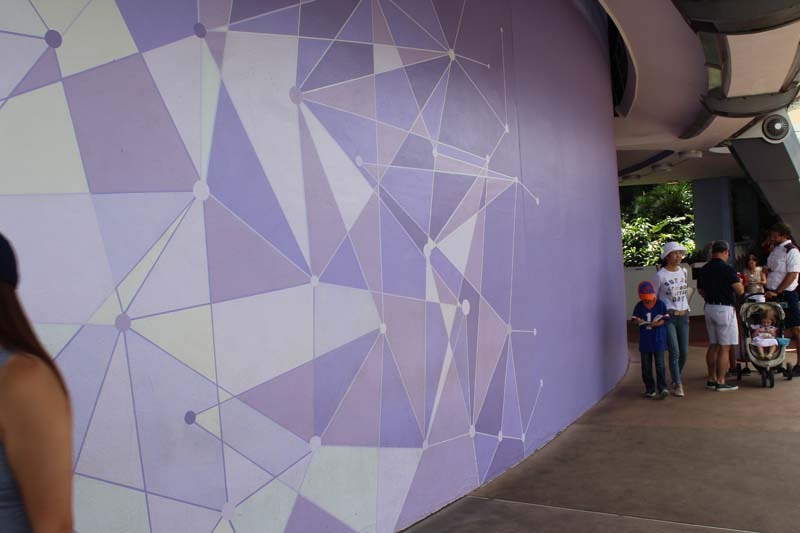 The wall was recently painted; so now you have a choice of a plain purple wall or a section with some geometric designs. We watch the kids so Tim and Marissa could go on Space Mountain. In the exit store, I spotted the same massage chairs they have back at Saratoga Springs. I paid a couple of bucks to enjoy/endure the pleasure/pain it gave to my aching muscles. Kelli and I headed back early to the resort as the others went to ride The Barnstormer We did stop for some much needed iced coffees from Joffrey's. The wait for the bus back was over 30 minutes. We relaxed inside the Carriage House until they got back. The last meal of the trip was again at Artist Pallet. Tim, Marissa and the kids had the kids meal nuggets, hot dog along with a caprese pie and brownie. We shared the cheeseburger pie and a cookie. Our Table in Wonderland card saved over $170 on this trip and $286 overall for our two trips. I also brought a new DVC umbrella I had been eying since our December/January trip. 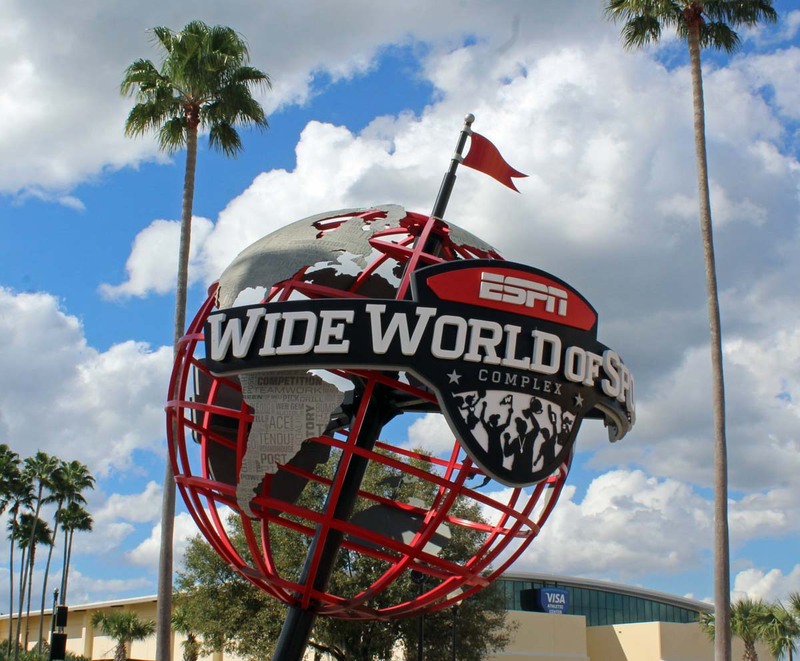 AP and DVC discounts saved another $109. Magical Express pick-up was at 3:40pm and surprisingly went straight to the airport. Our JetBlue flight back to JFK was delayed as high winds had delayed many flights for the day. We had to wait until a flight crew to arrive from Westchester County. Our 7:07 flight started to board at 8:30pm. Once back, our brother in law Rich picked us up. We were back home after midnight and up for 22 hours. Overall, it was another great trip. Kelli and I enjoyed viewing the race even more than last time. 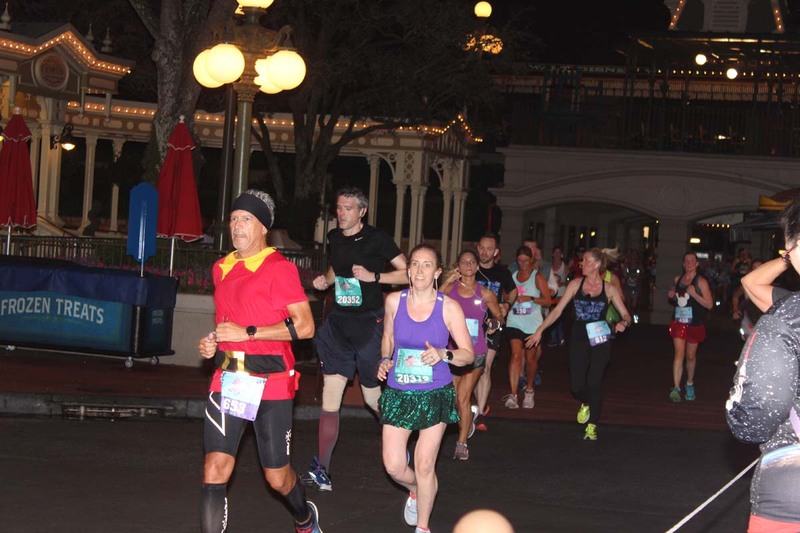 It has such a positive vibe from spectators, cast members and runners. 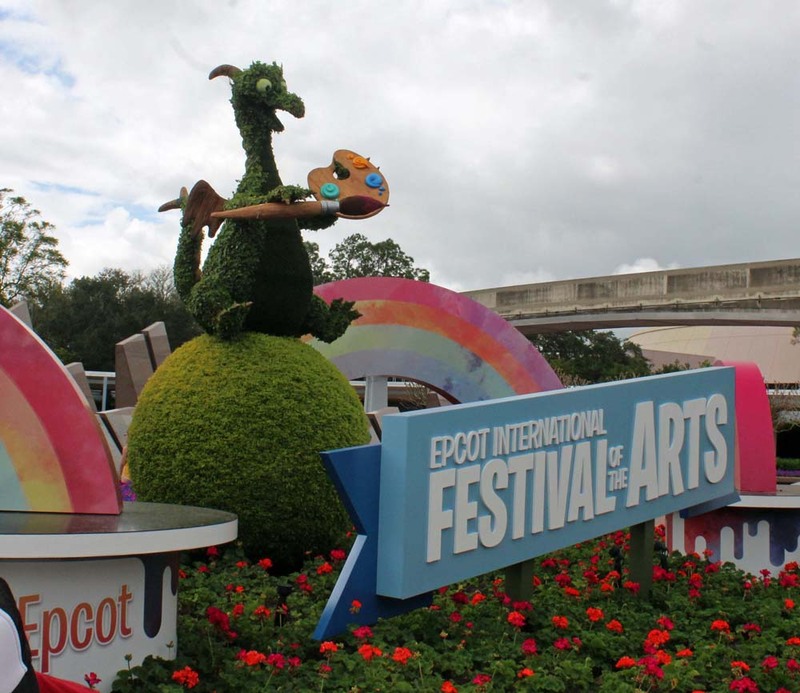 We had a taste of the new Art Festival in Epcot. We could have easily spent more time here. These short trips do make you try to pack in a lot each day. 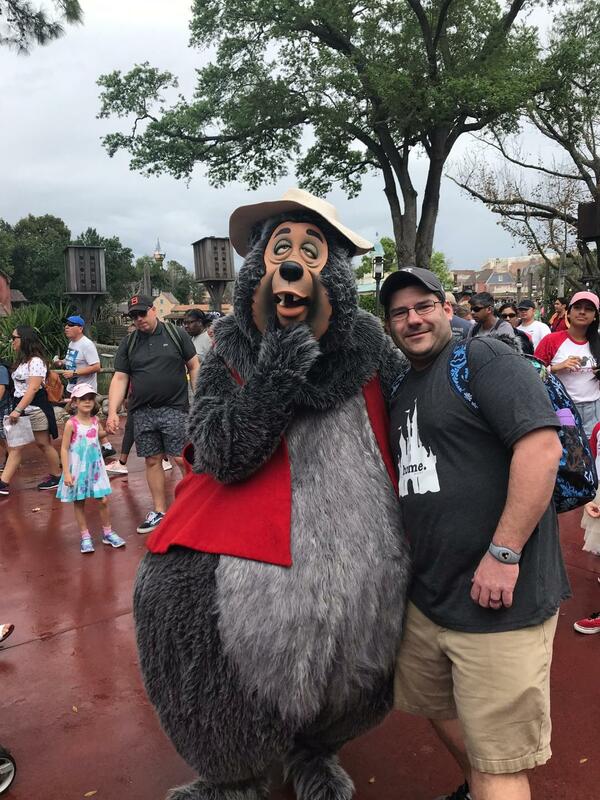 We look forward to our next trip, which is longer and we plan to rest mid-day so we can be fresh and enjoy some of the nighttime firework shows.